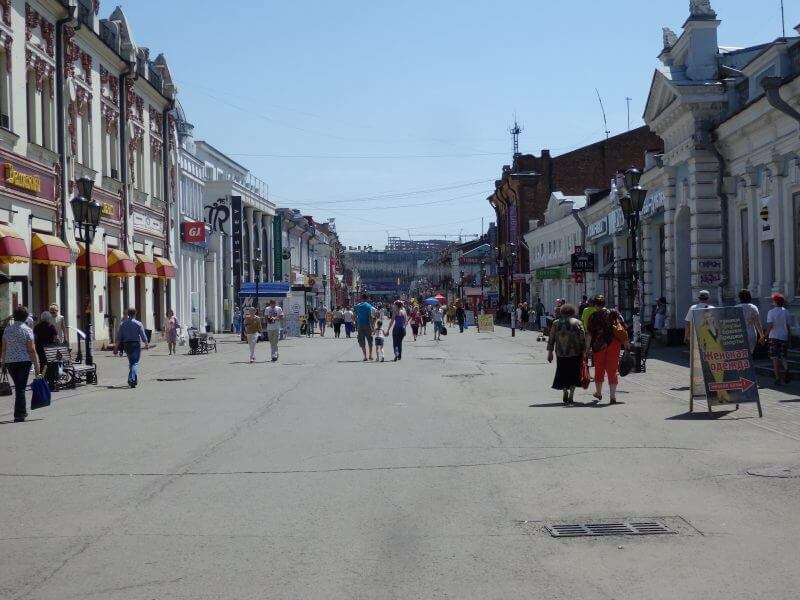 Irkutsk, one of the larger cities in Siberia, where nobles and intellectuals were exiled after the Decembrist revolt. For a while culture flourished, then blood poured as the Bolshevik Revolution broke out. 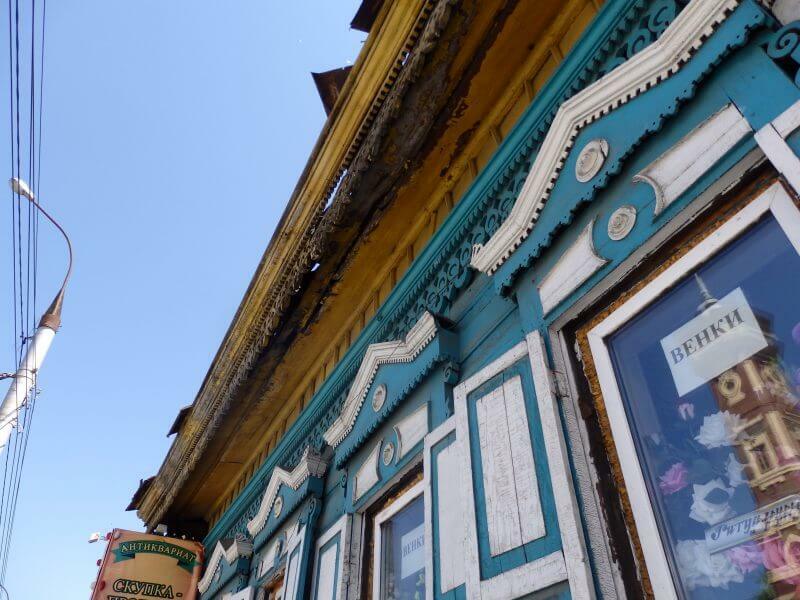 Today, Irkutsk isn’t exactly beautiful or stunning, but has its own quiet charm with a hint of its colourful past. 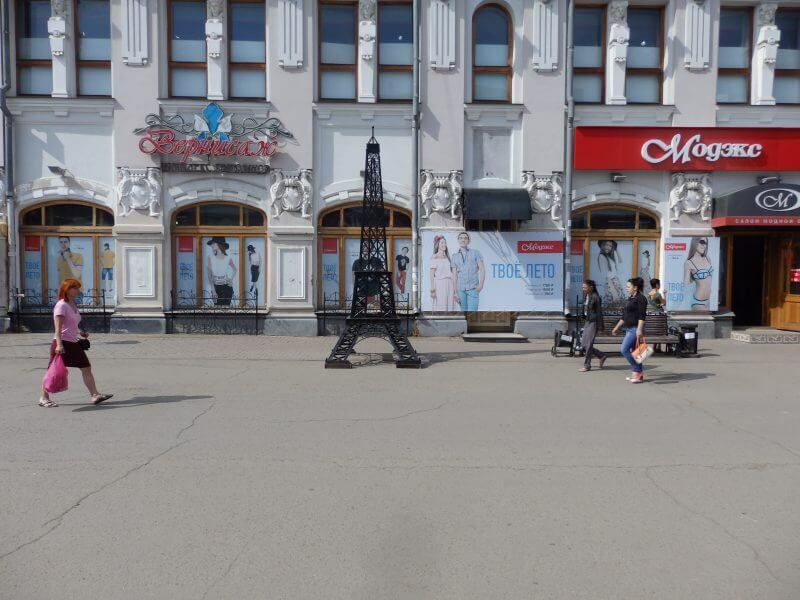 Irkutsk, (once) the Paris of Siberia. 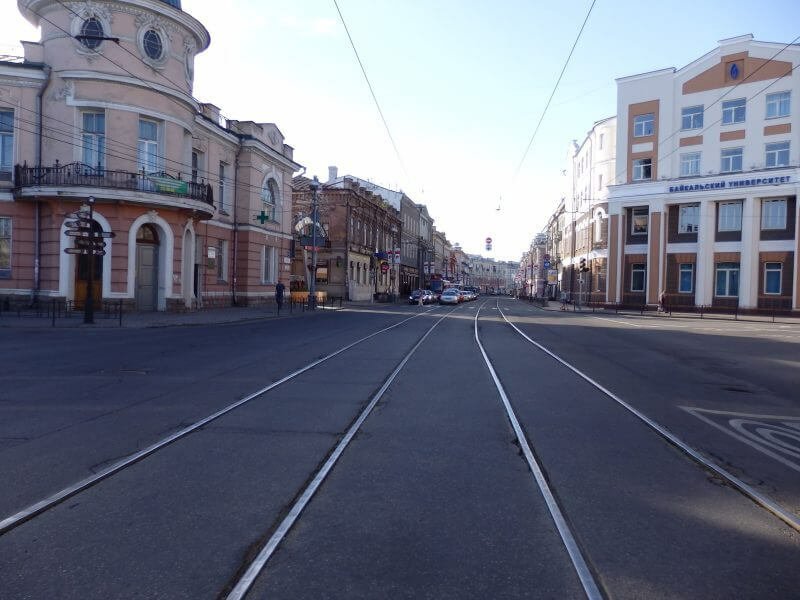 After more than 2 days on the Trans-Siberian Railway from Beijing, I was ready to get off for some leg stretching, to explore my first city in Russia, and to go for a nice hike in the Siberian ‘wilderness’. 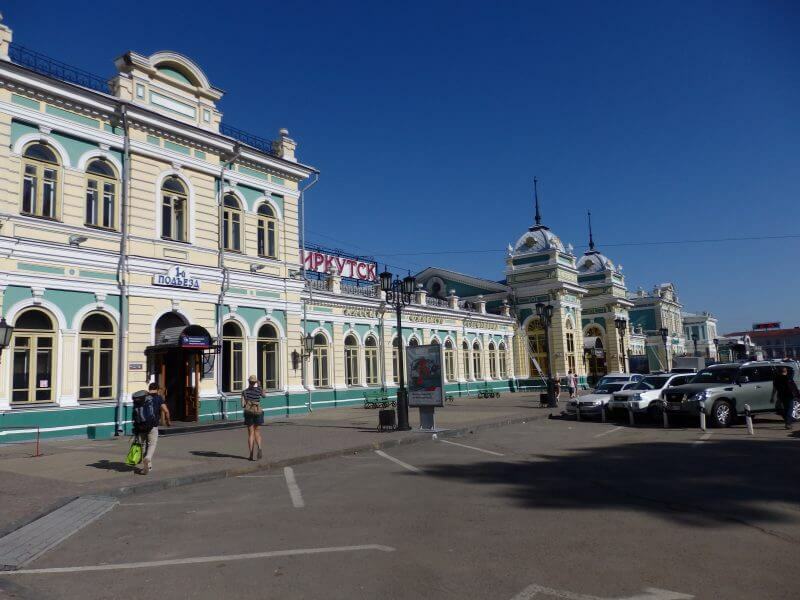 I got off the train at Irkutsk and made my way to Baikaler, a hostel with a friendly owner, which I had booked via email prior to the trip. It was late in the afternoon then, but the longer daylight hours in summer meant that there was some exploration I could squeeze out of the day. The Angara river features prominently, flowing from the largest freshwater lake in the world, Lake Baikal, to Irkutsk, not too far away. The railway station and the city are on opposite banks, so I had to first cross the bridge, fortunately not over troubled waters. 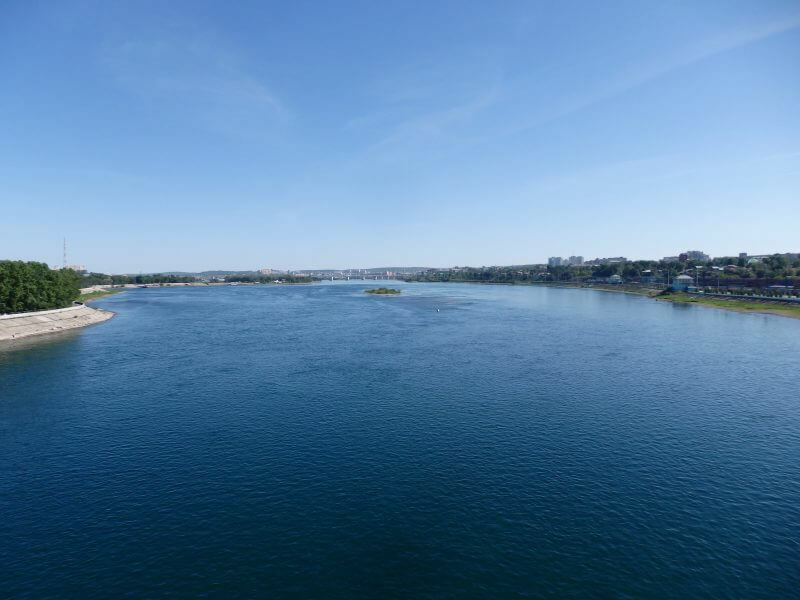 The Angara River, between the city center and the train station. Main outflow of Lake Baikal, the largest freshwater lake in the world. 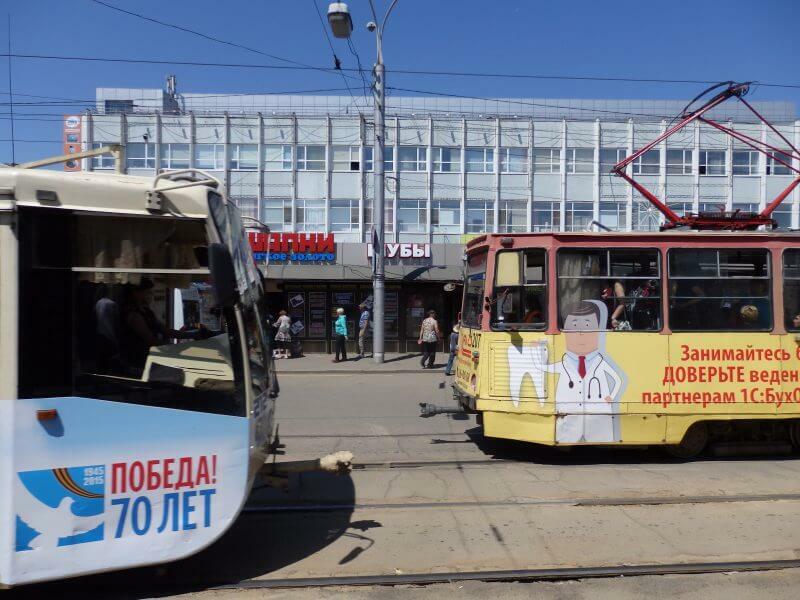 Trams are widely used in Irkutsk. 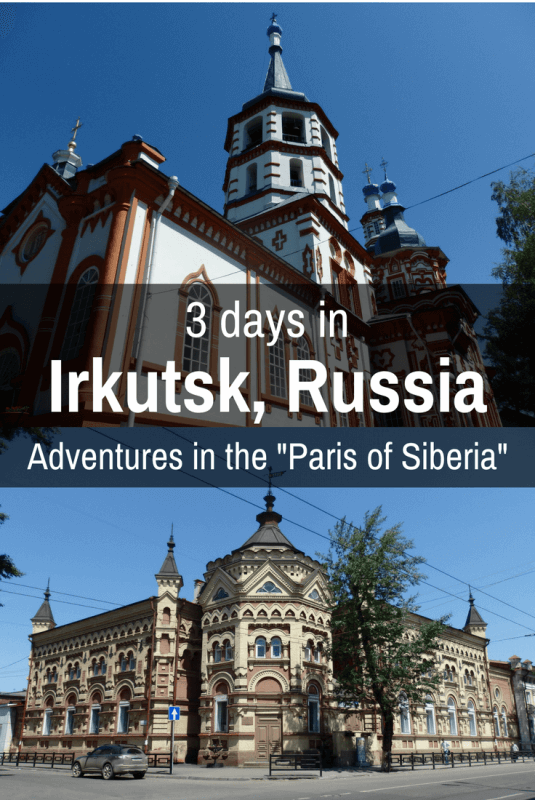 I didn’t take any though, Irkutsk is a compact city with with most sights within walking distance. After checking in, went out for a walk around the area. 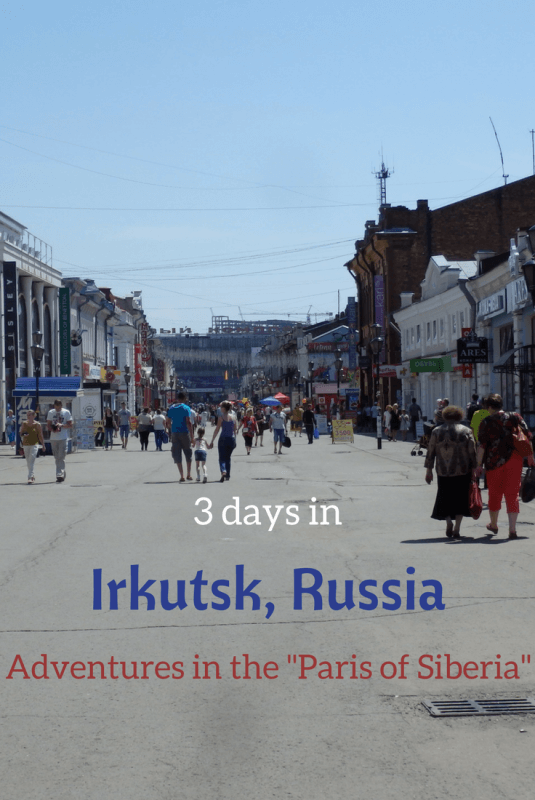 Seemed very much like some European cities I had been to, except that Irkutsk is so much nearer to Asia than Europe. The 130th District. 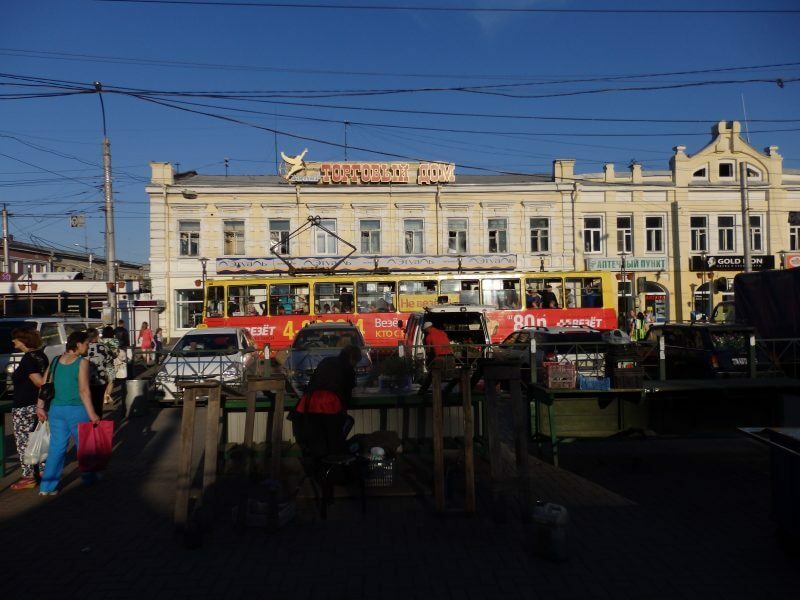 Historically a residential area but now filled with cool restaurants and bars. 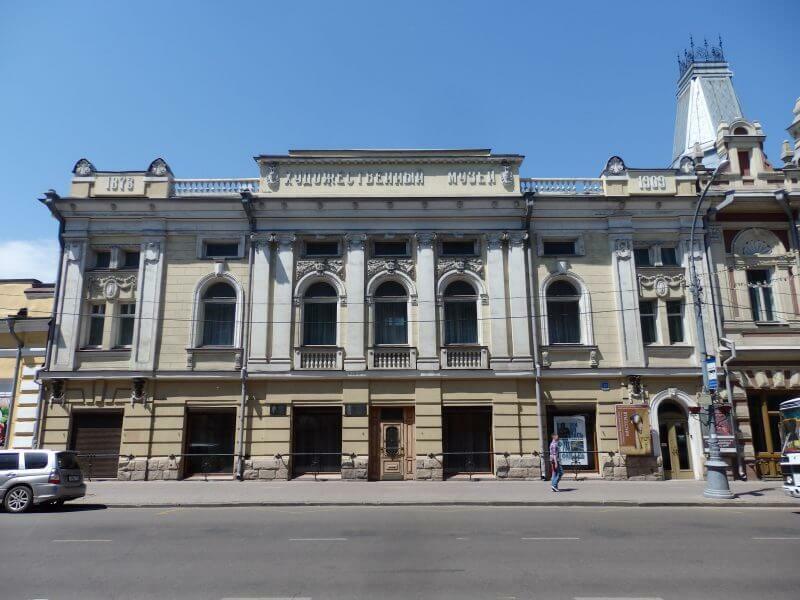 1st Public Hall (1891). 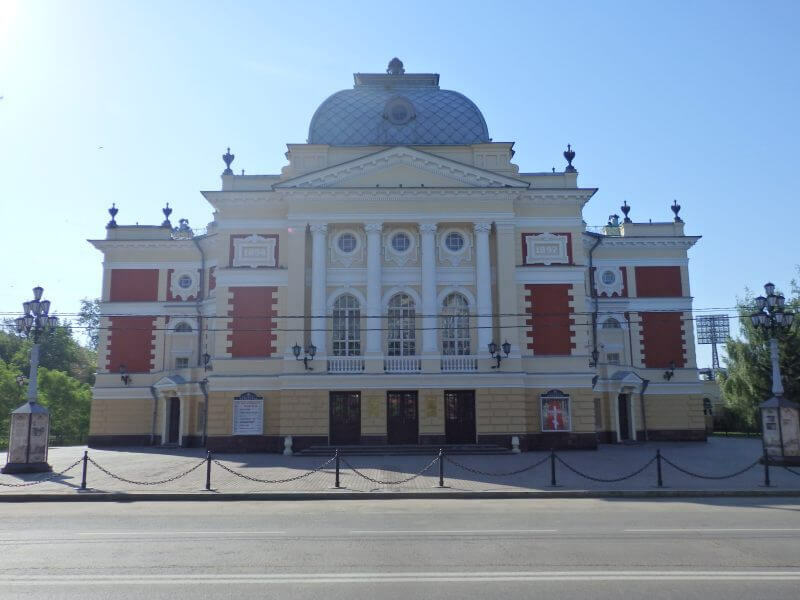 Current the Youth Theatre and Philharmonic Hall. Or, yellow bus at traffic crossing. 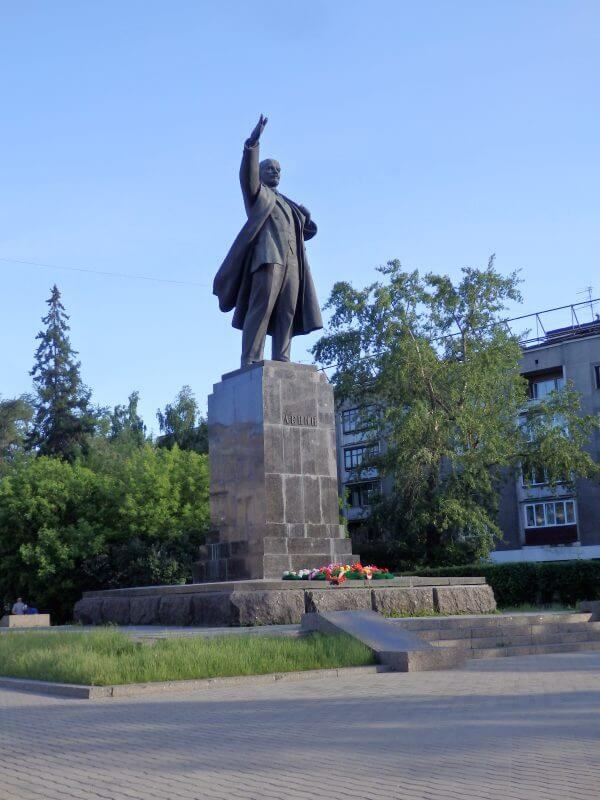 Monument to Vladimir Lenin (1952). Tram rails. 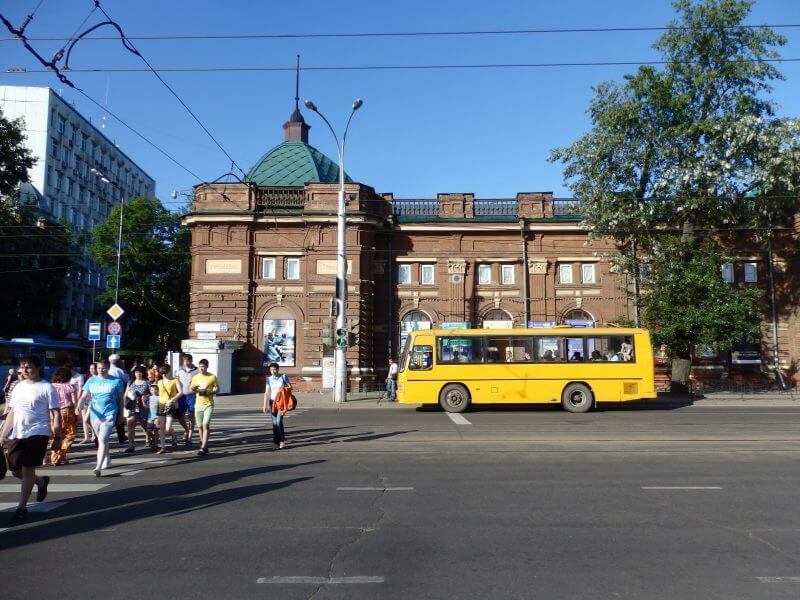 On the left, currently a clinic, historically the Russian-Asian Bank (1912). 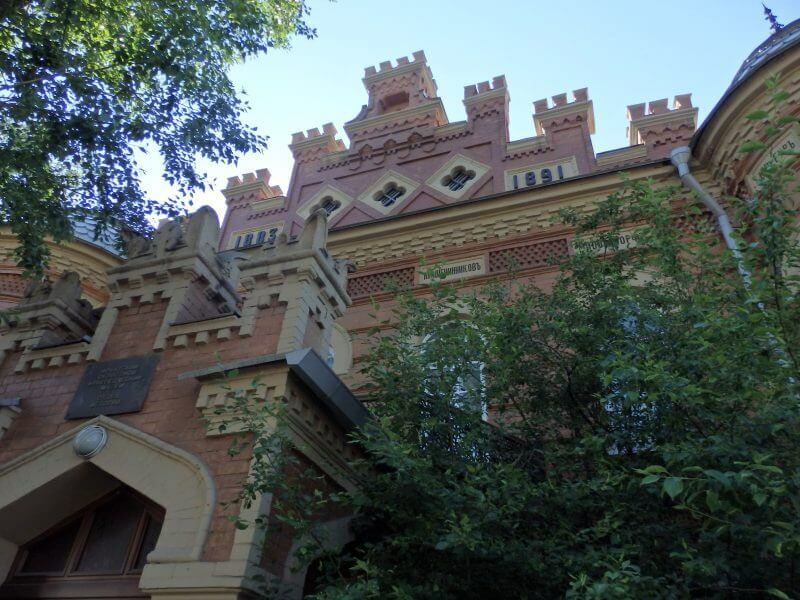 On the right, currently the Baikal State University of Economics and Law, formerly the Alexander and Mary College (1895). 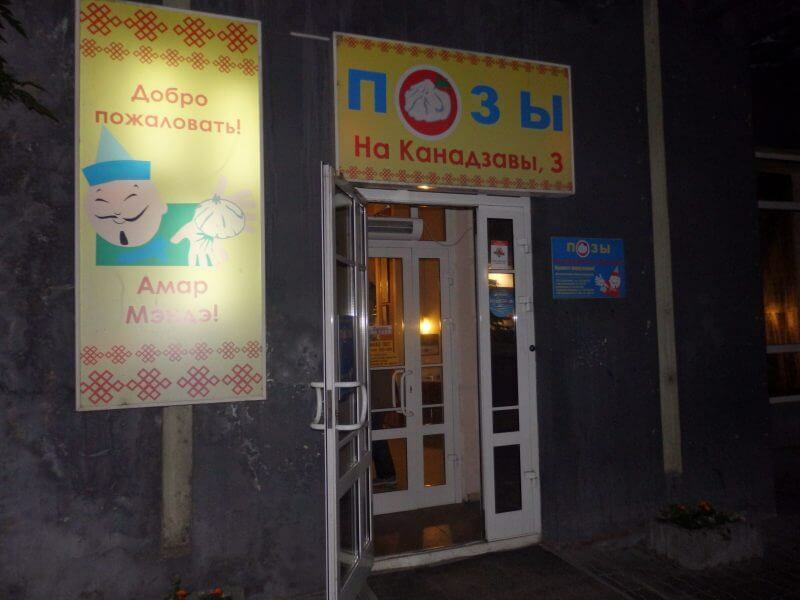 For my first proper meal in Russia (not counting the instant noodles I had on the train), dinner at a place recommended by hostel staff for affordable and good food. Was kinda Ikea style where you’d pick what you want along a line and pay at the end. Lots of different stuff to pick from. 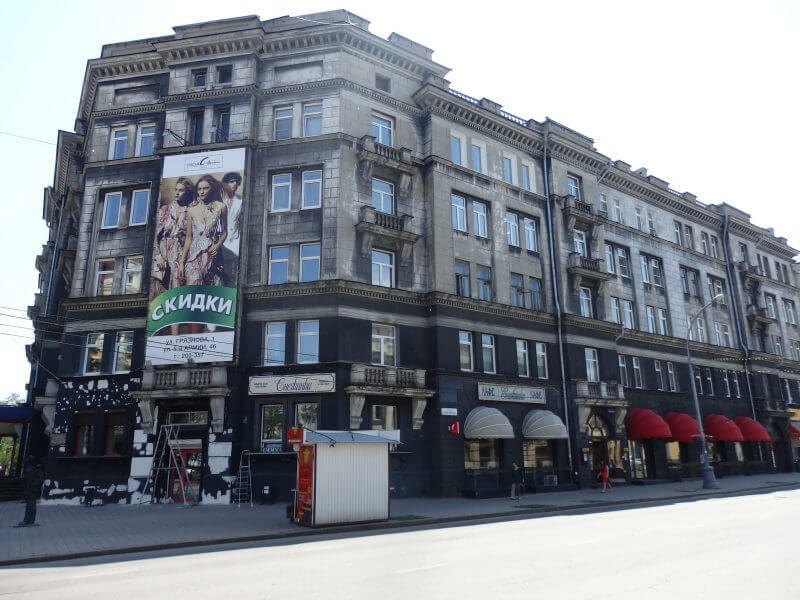 I later learned that this style of restaurants (stolovaya) was popular throughout Russia. A little tricky because I could not speak Russian so I wasn’t too sure what I was getting. Makes for a great adventure every meal. 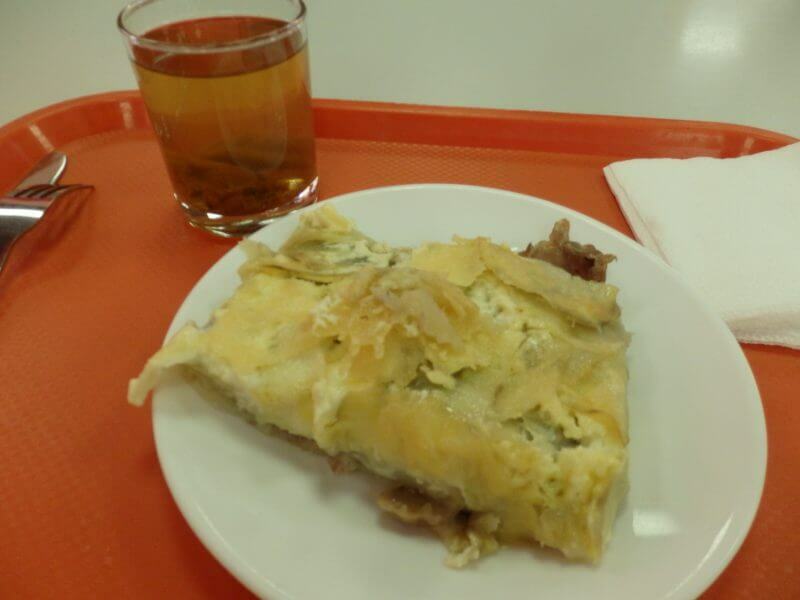 Dinner at a stolovaya, or Russian style canteen. Wasn’t enough so I went for seconds. Ordering food got easier as time went by. Having a big appetite helped too. Total for 2 rounds was ₽269 or about S$5.10 based on today’s exchange rate and ruble prices on that day. 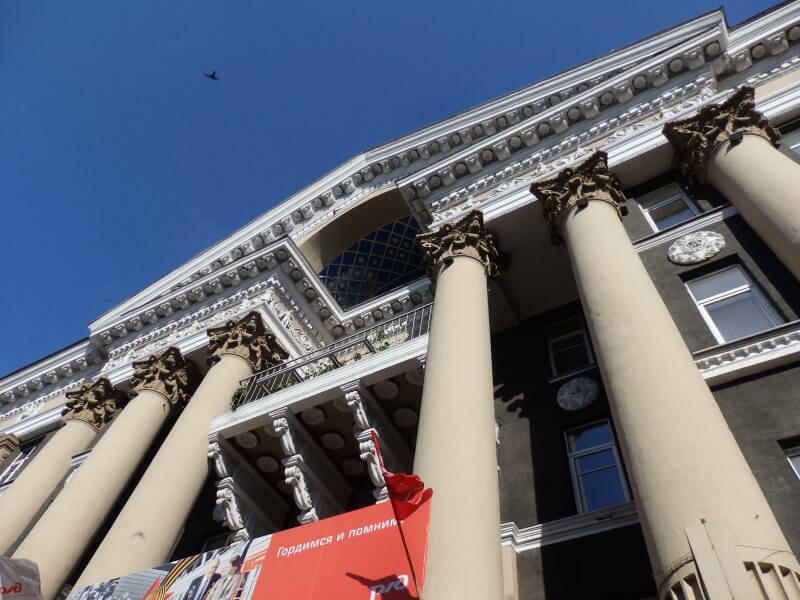 The ruble seems to have fallen significantly since my trip, was probably about S$6.60 last year. Second round. I had missed freshly cooked food after 2 days on instant noodles and preserved food. Travelling on the train needn’t be that tough, but I happen to almost always make things tougher for myself. Not on purpose. The place where I went for many of my meals for the next few days. There were so many dishes to pick from, I don’t think I went one round through. 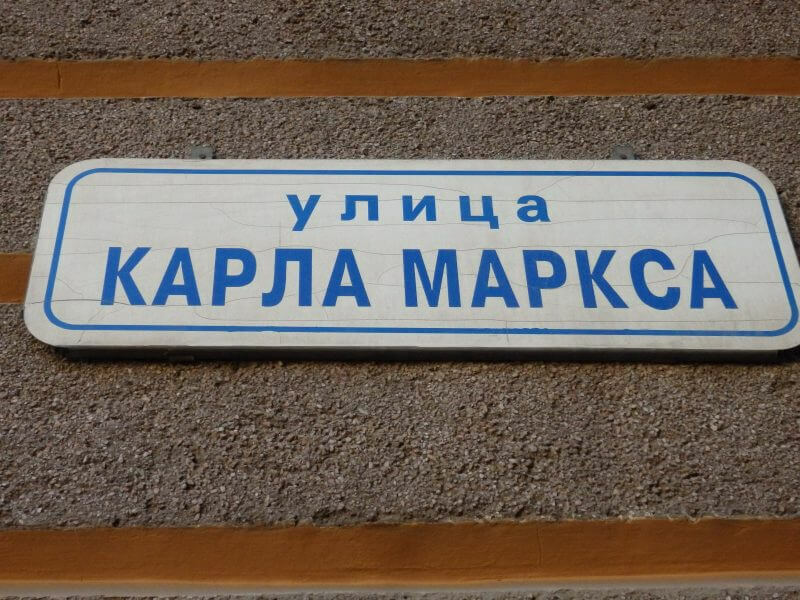 Recurring themes in Russian cities: Karl Marx Streets (Ulitsa Karla Marksa), and Lenin Avenues (Prospekt/ Ulitsa Lenina). 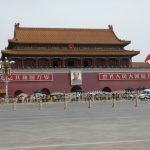 The next morning, I set out to complete a self guided tour round the city. 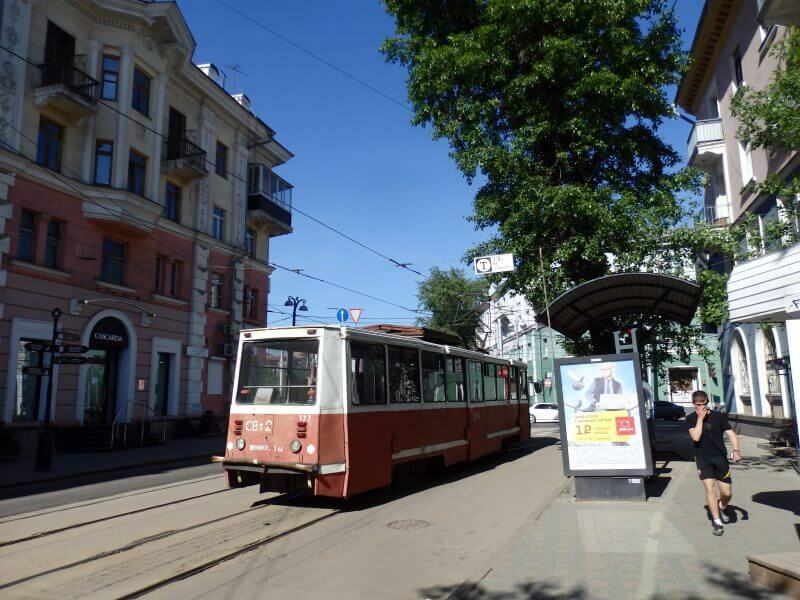 It’s really easy as the route is painted onto pavements (green line), and at each point of interest there are clear signboards in Russian and English explaining its significance. 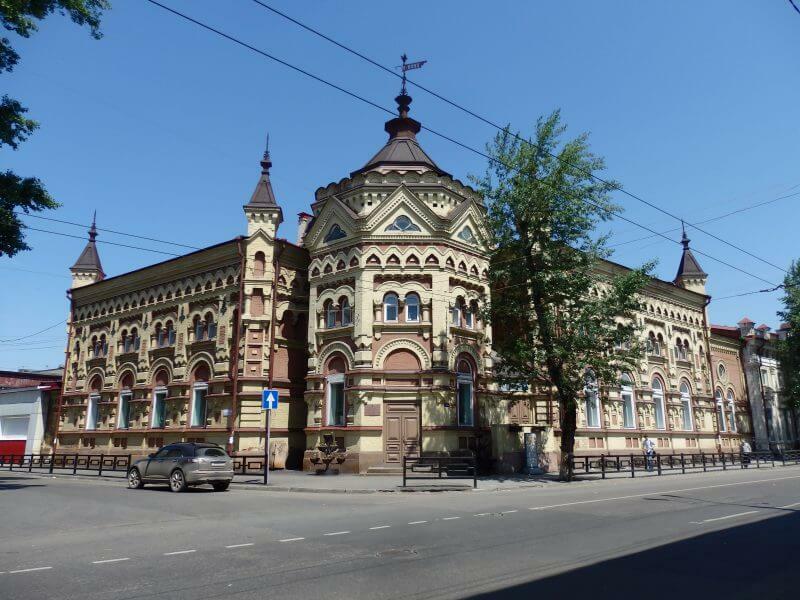 Most buildings in Irkutsk were built after 1880 due to a huge fire in 1879 which destroyed three quarters of the city. Here a selection of the points of interest along the way. And some random shots. 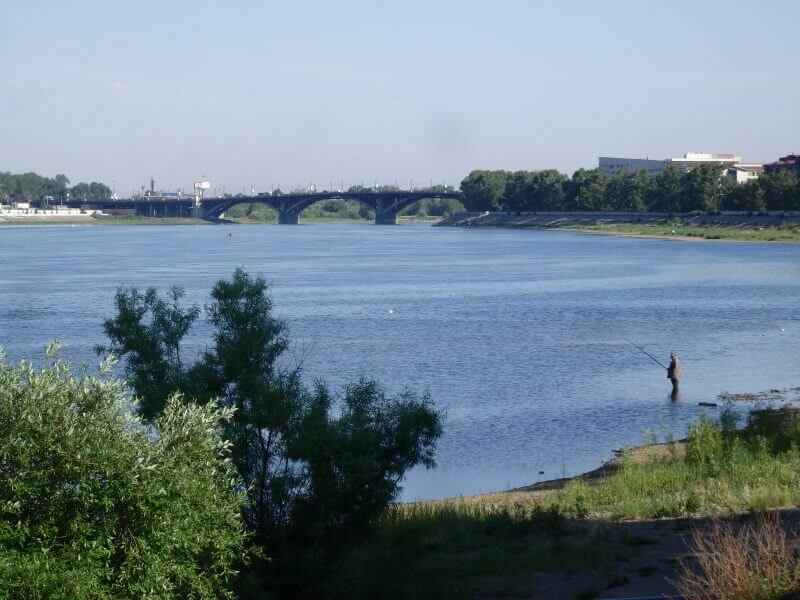 Fishing at the Angara River, and the bridge I crossed the day earlier to enter the city. 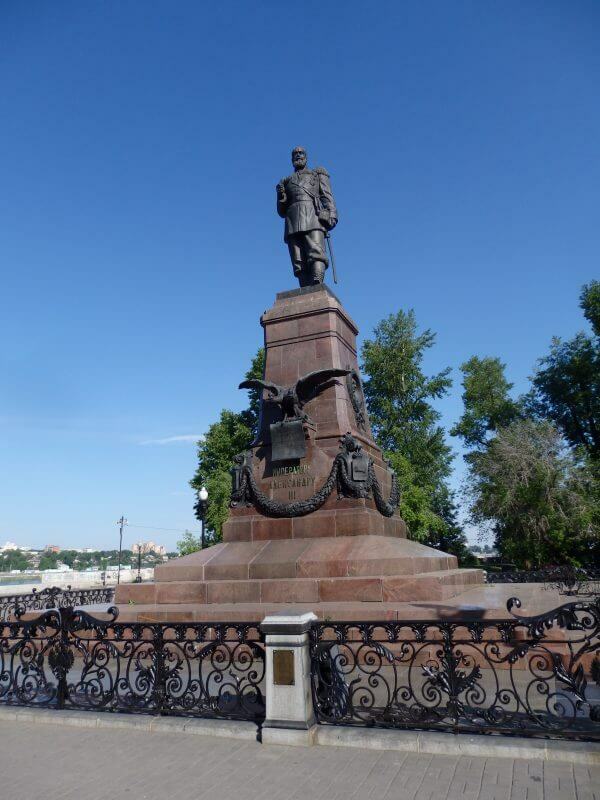 Monument to Emperor Alexander III (1908), to commemorate his decision to build the Trans Siberian Railway. 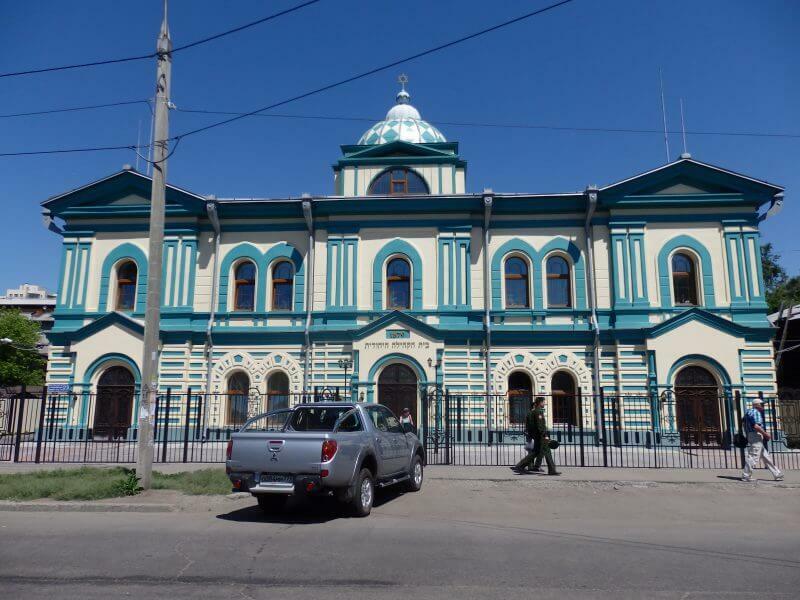 Formerly the East Siberian Branch of the Russian Geographic Society (1883). 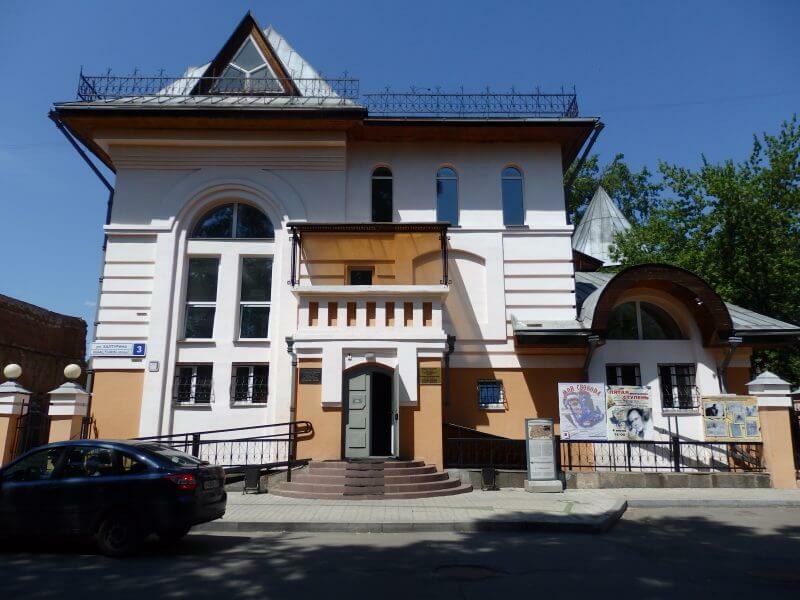 Presently, the Museum of Local History. I was eavesdropping on their conversation. 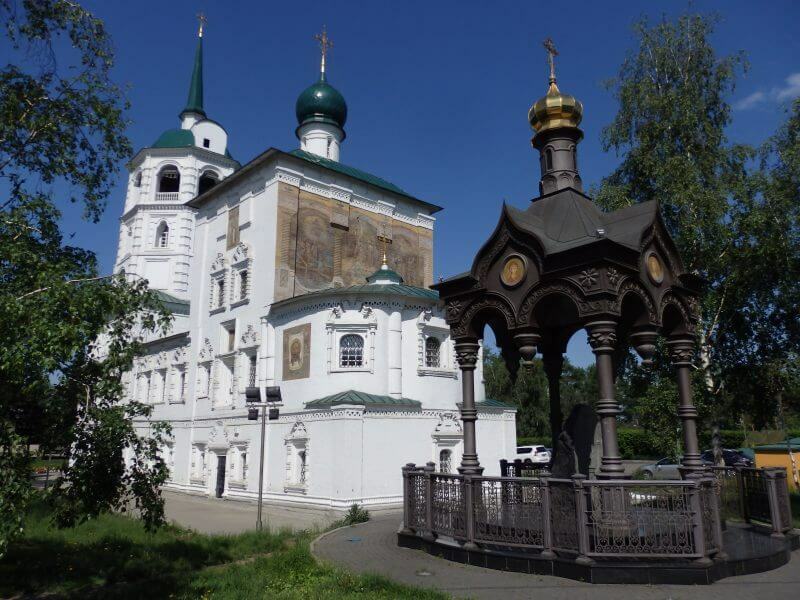 Church of Mikhail Archangel (1790). 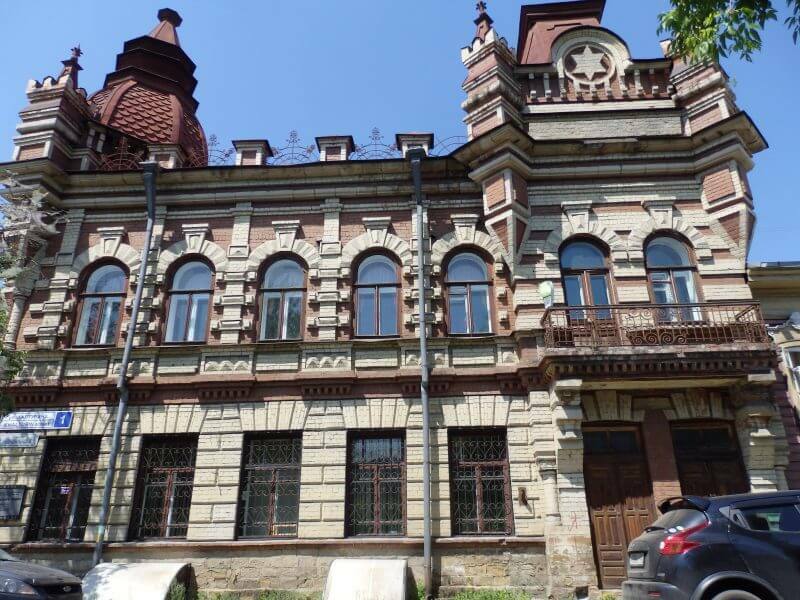 Complex of Bazanov’s Education House with Maternity Department (1883). Today, the Hospital of Eye Illnesses. 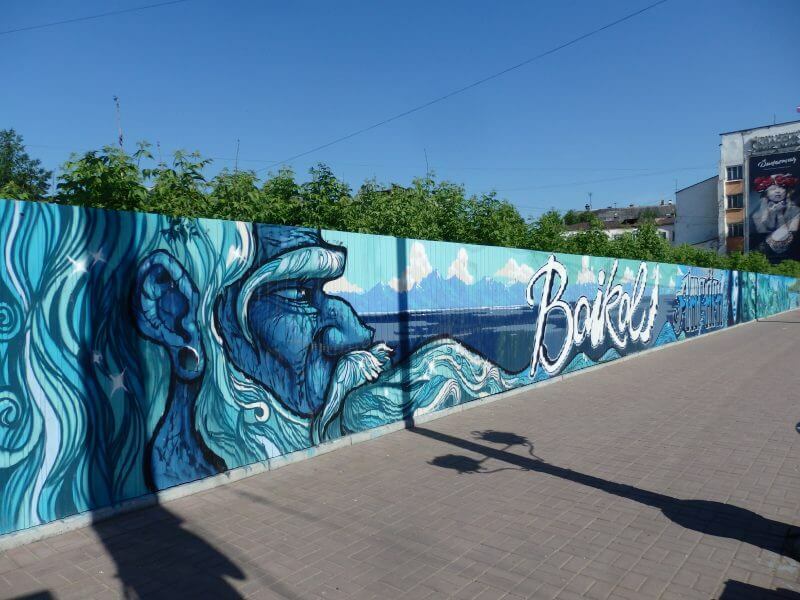 Street art in Irkutsk, further down. 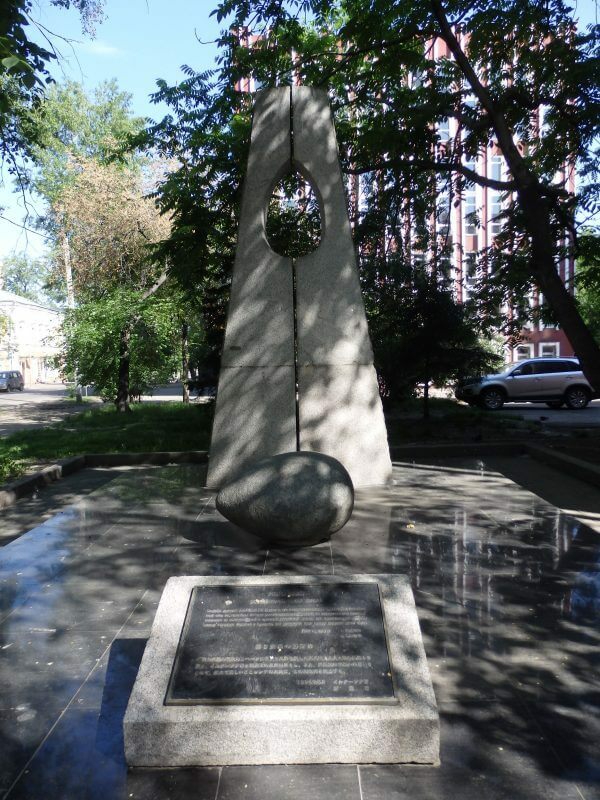 A Monument to Friendship between Russia and Japan (1994). 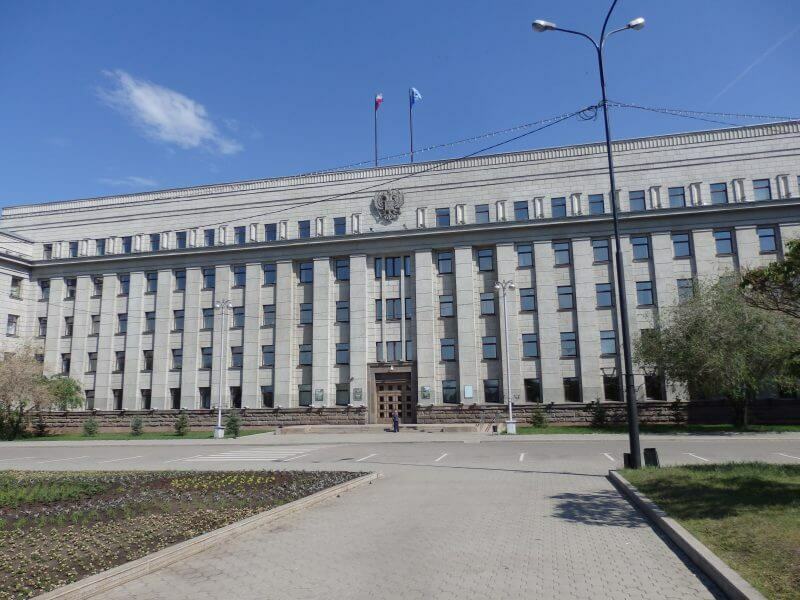 One of the traces of the Soviet Union in Irkutsk, the monolithic House of the Soviets. House of the Soviets (Government of the Irkutsk Region), 1959. 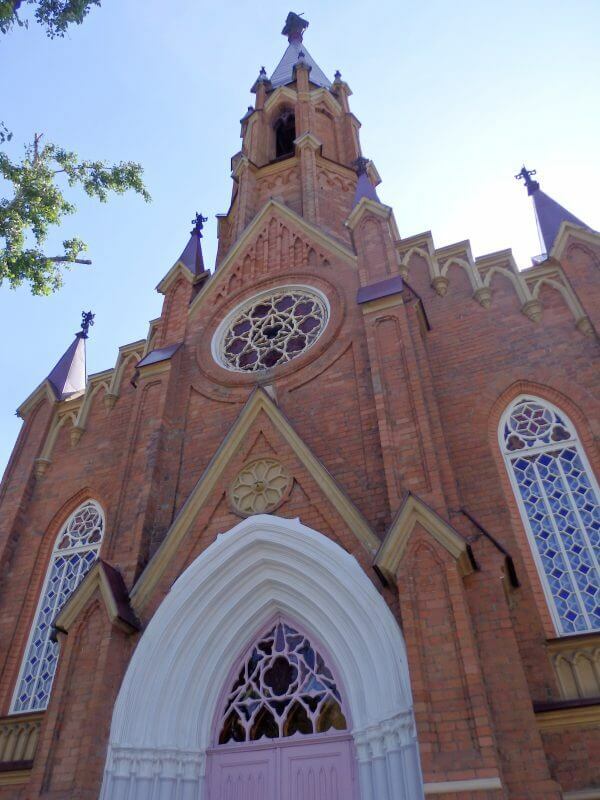 Polish Roman Catholic Church (Organ Hall of the Irkutsk Philharmonic). 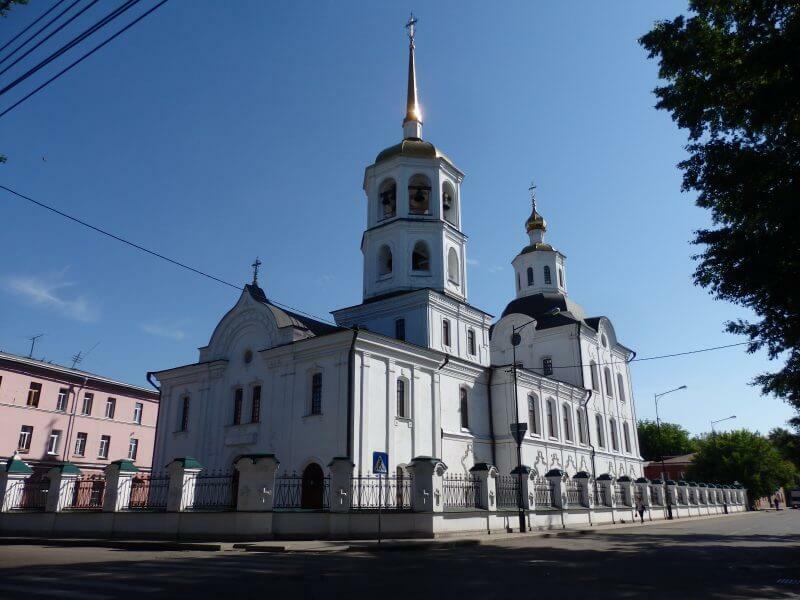 Church of Our Saviour (1706). 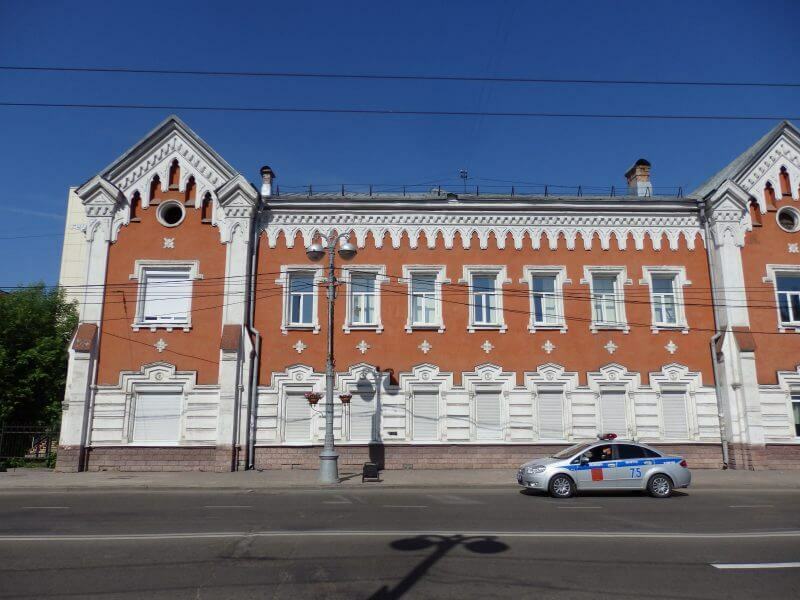 Oldest stone building in Eastern Siberia. 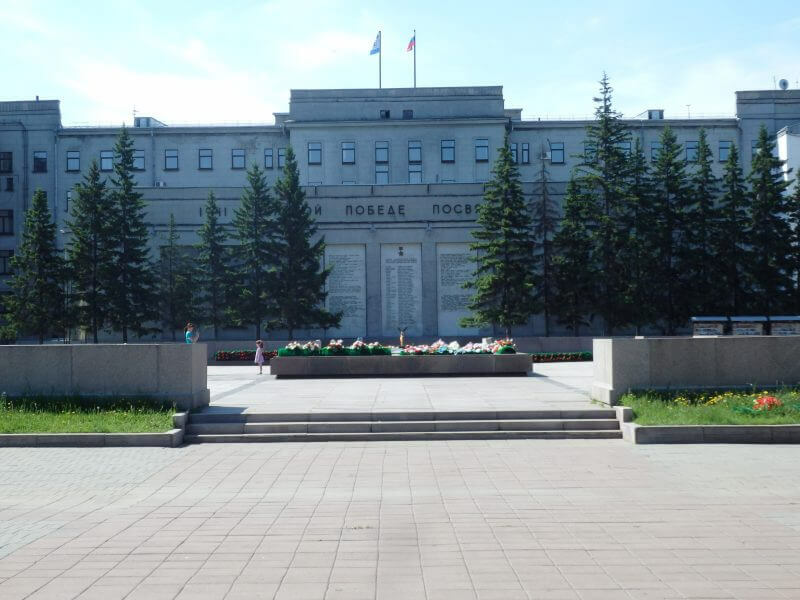 Memorial Complex ‘Irkutsk Residents of the Patriotic War of 1941 – 1945’ (1975), with an eternal flame lit with the torch relaid from the Tomb of the Unknown Soldier at the Moscow Kremlin Wall. A story about a couple, miracles, and a lucky bunny. 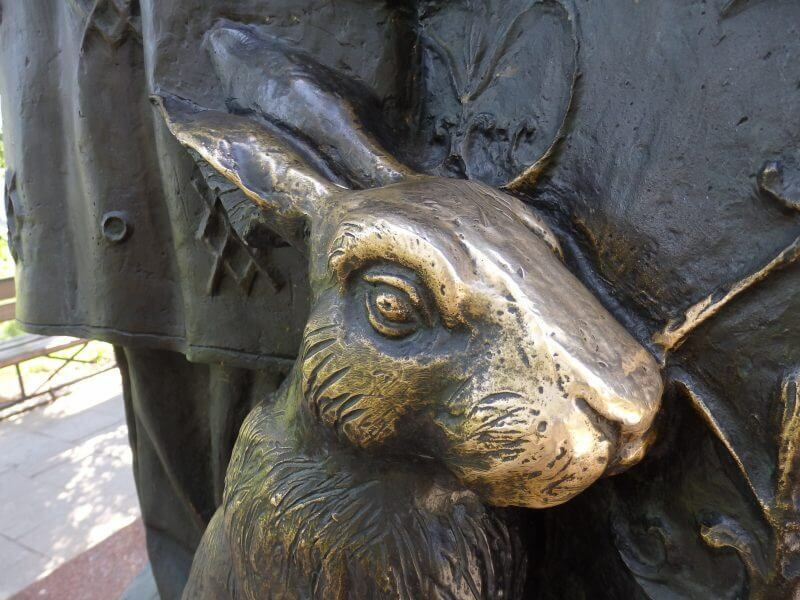 If you ever erect a statue/ sculpture and want a specific part kept shiny, add a description mentioning that touching it brings good luck. 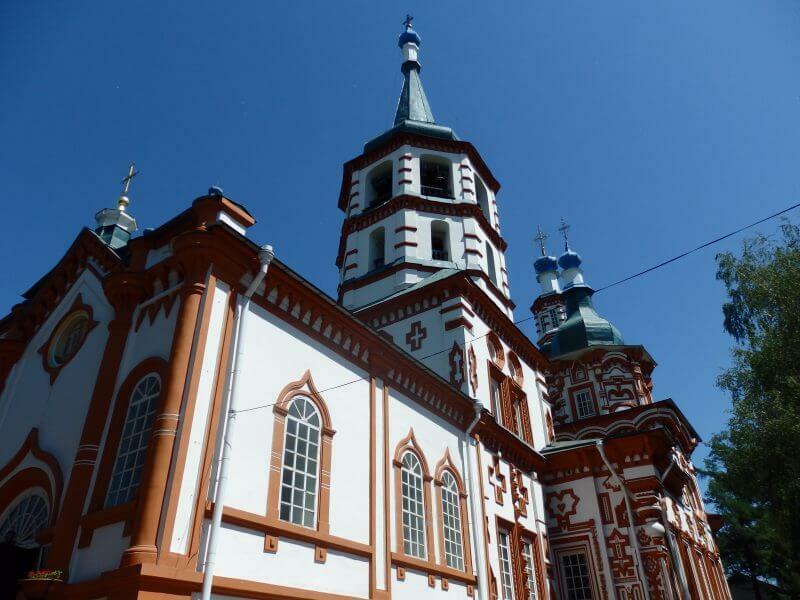 The Epiphany Cathedral (1718). Beautiful. 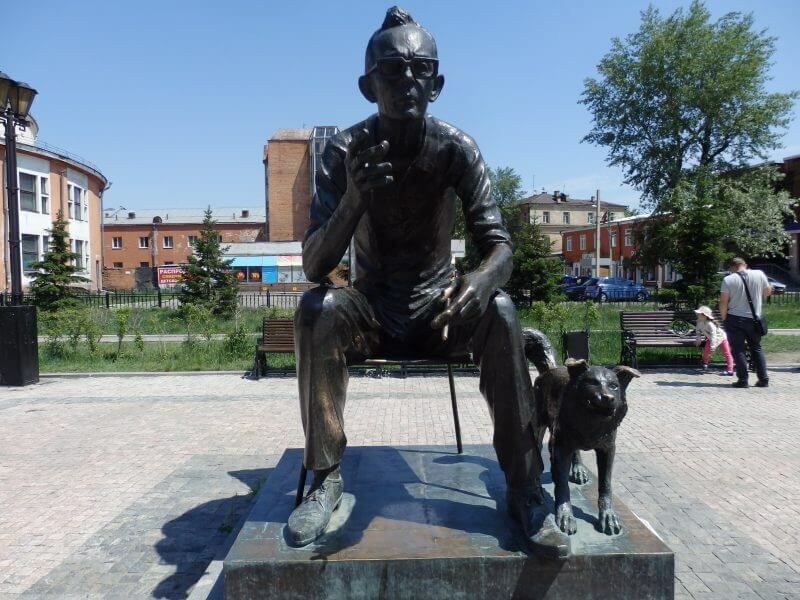 Monument to the Founders of Siberia. 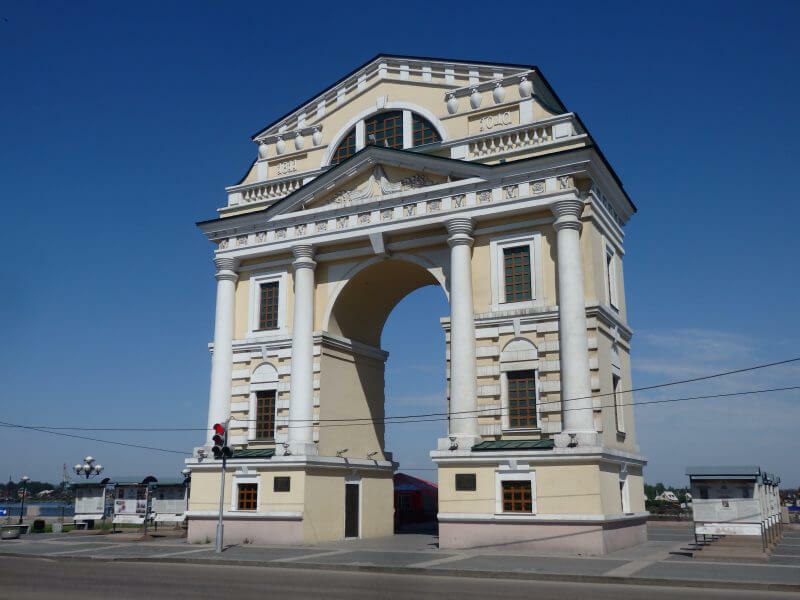 The Moscow Triumphal Arch. Built in 1813, dismantled in 1925, reconstructed in 2011. 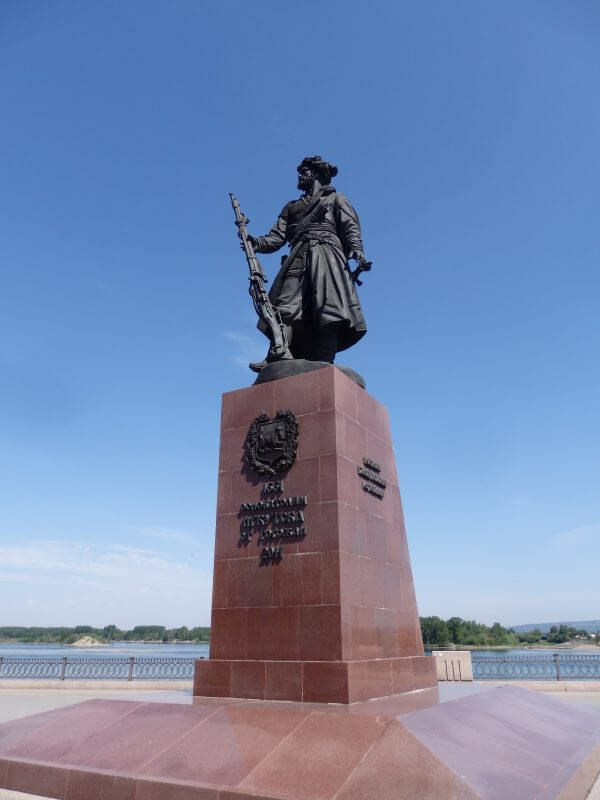 Situated on the right bank of the Angara River. 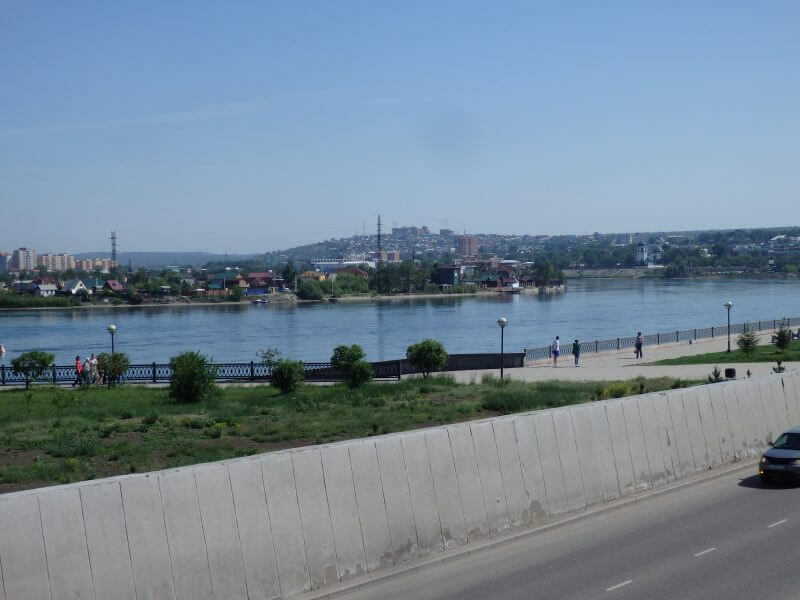 The Moscow Highway (I suppose a highway from Moscow) reached the left bank, and after a boat bridge (no longer present), people would be able to enter Irkutsk via the arch. 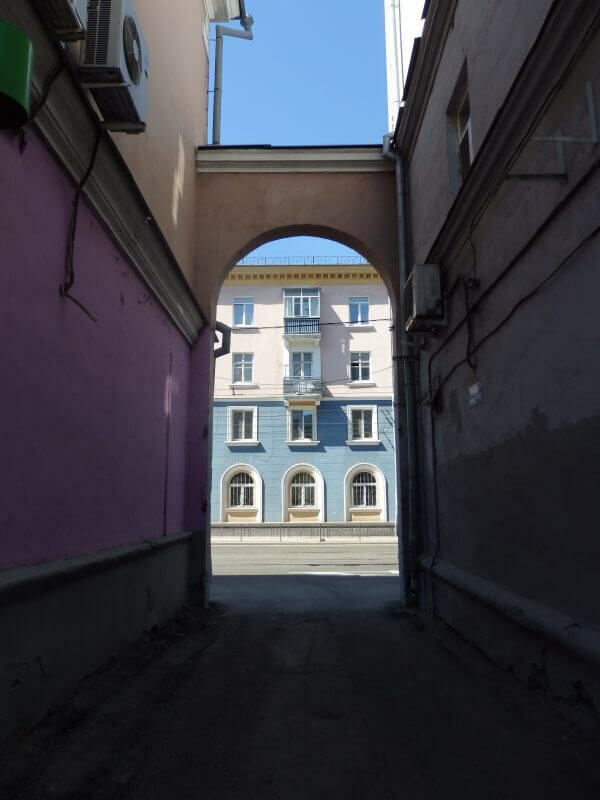 From 1813 till the end of the 19th century, almost all visitors to Irkutsk had to pass through inspection and registration at the arch. Further from the city center, things got a little quieter, and buildings a little more quaint. 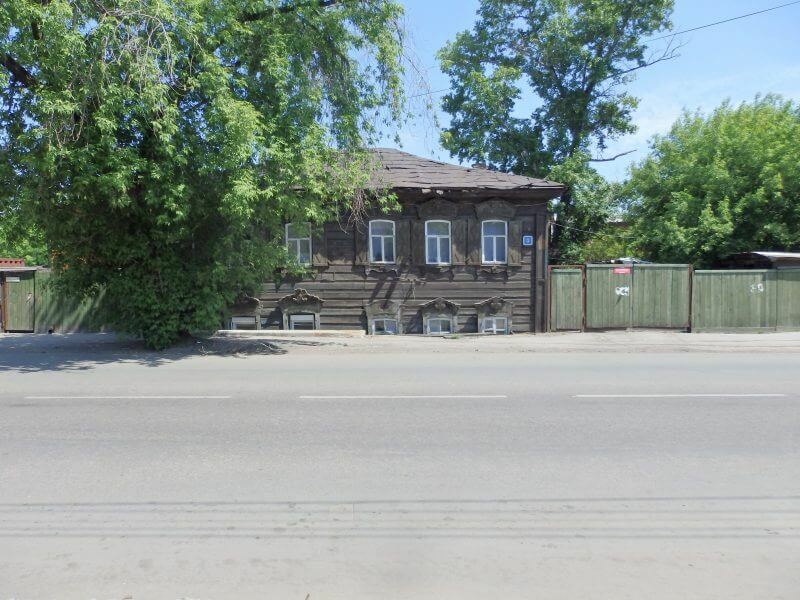 Cute wooden houses in Irkutsk. I stopped for lunch at Mamochka, which served food in similar style to the stolovaya I had dinner the day before, but a little pricier. 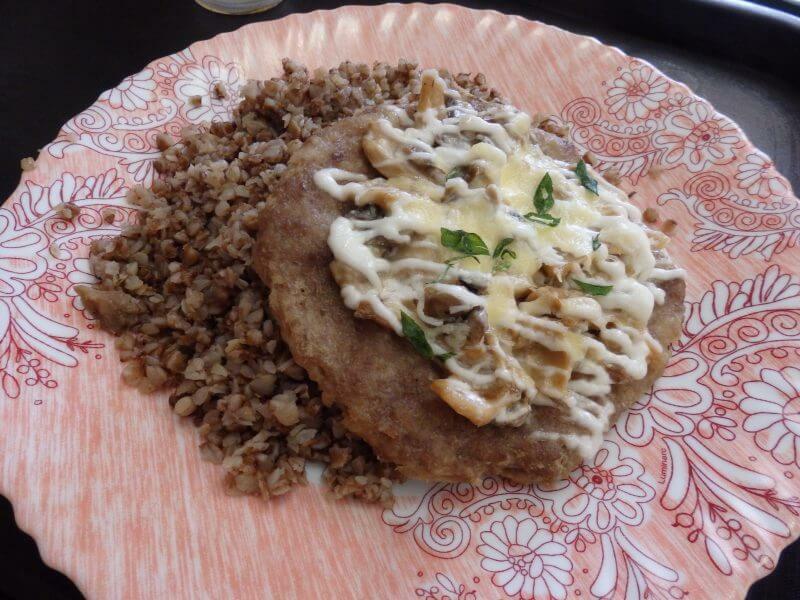 Lunch at Mamochka. The place had an nice decor. Seconds, as usual. 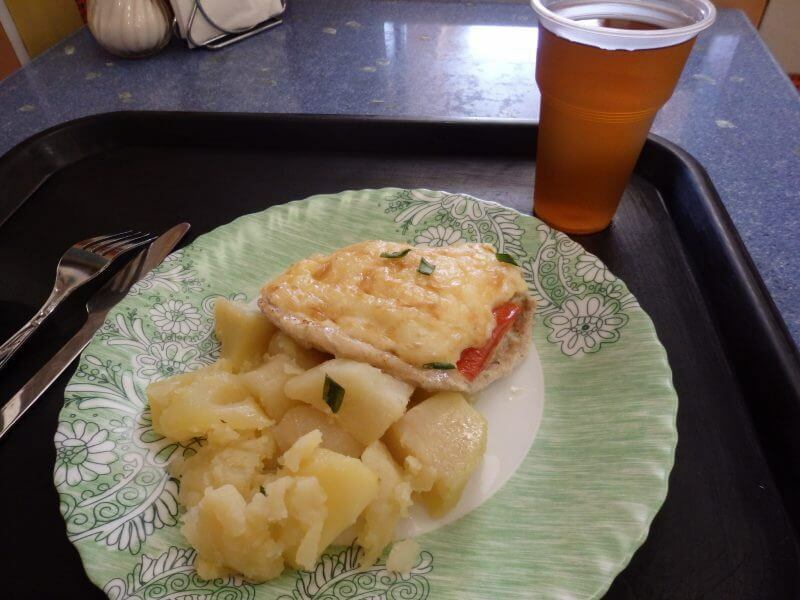 (Total for lunch: ₽470). 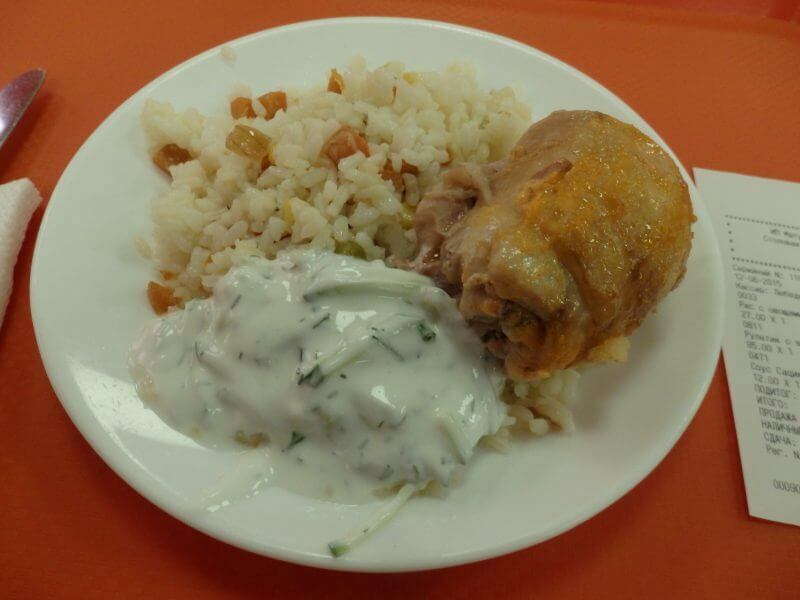 Doesn’t look that appealing, but tasted decent. Looks like they’ve got a following. Back exploring the city, with my stomach satisfied. 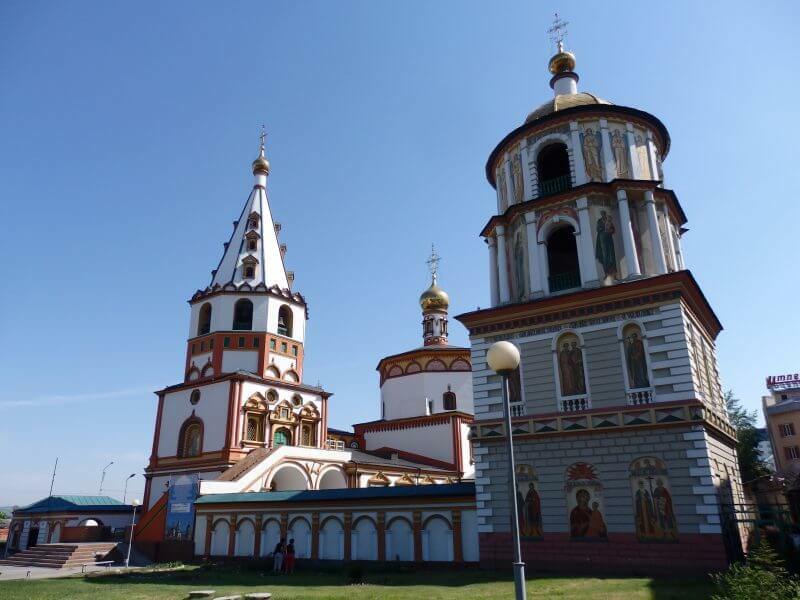 Though Irkutsk city is small, there were quite a few intriguing and fascinating buildings and churches around, of many different styles. 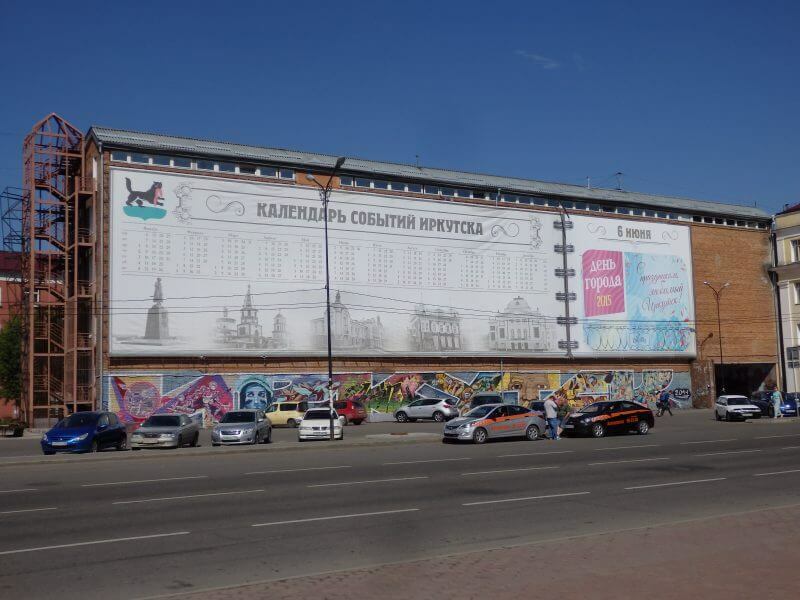 The City Exhibition Center of V.S. Rogal (1999). Joshua Fineberg’s Mansion (1901). Once wore many hats, but now the Regional Library. 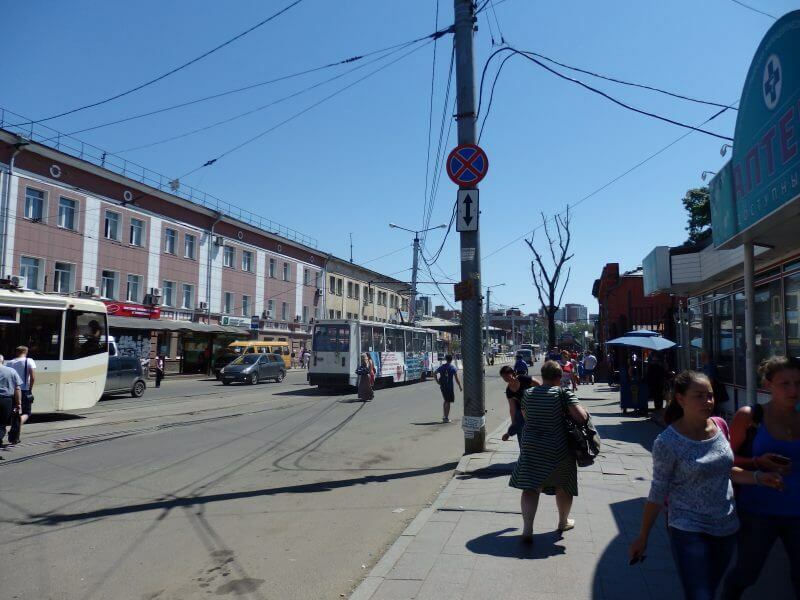 1st Arsernalskaya Street (Ulitsa Uritskogo). 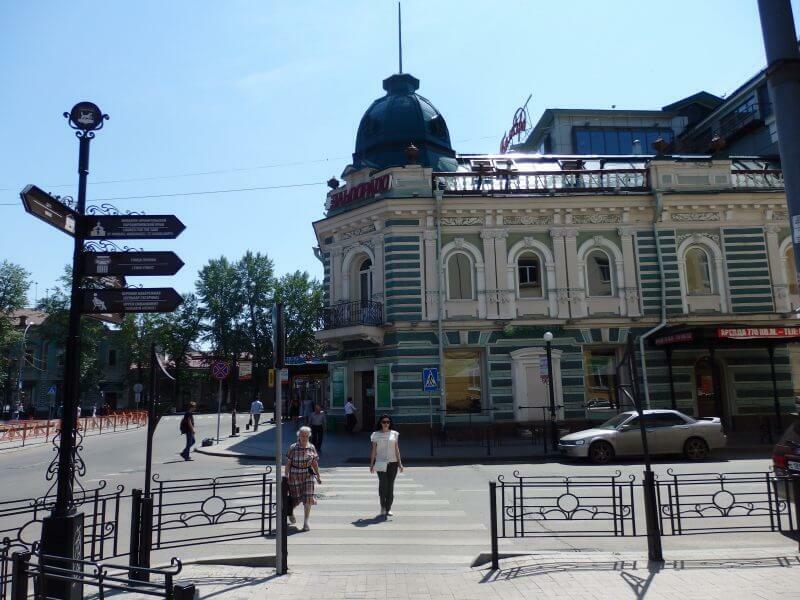 One of Irkutsk’s oldest business streets, and a nice place for people watching. 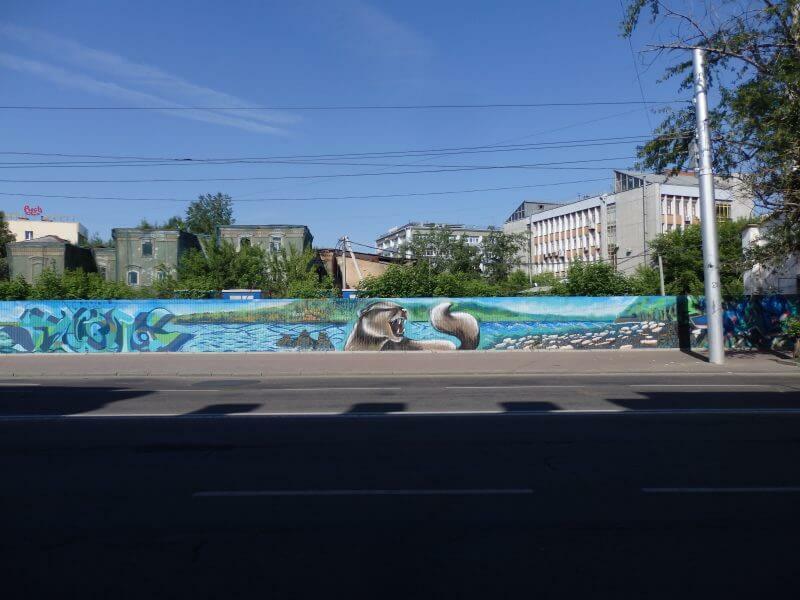 1st Arsernalskaya Street (Ulitsa Uritskogo). 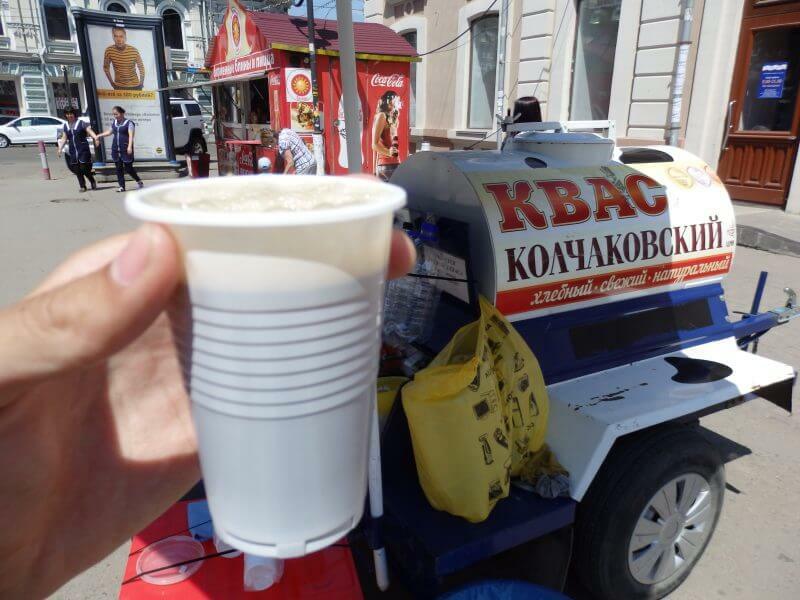 I tried Kvass (₽11 rubles a cup). It seemed popular, with little vats like that around the city. It’s a fermented beverage with low alcoholic content (<1.2%). Classified non-alcoholic by Russian standards (by law), so I guess it’s appropriate for kids. quirky taste, a little sweet, a little funky. 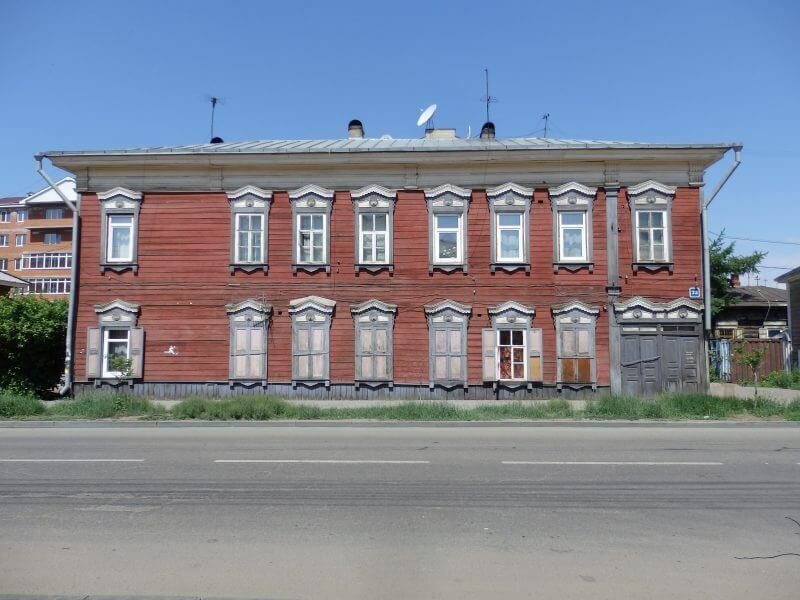 One of the many European style buildings in Irkutsk. I took a short bus ride out of the city center to visit the ice-breaker Angara. 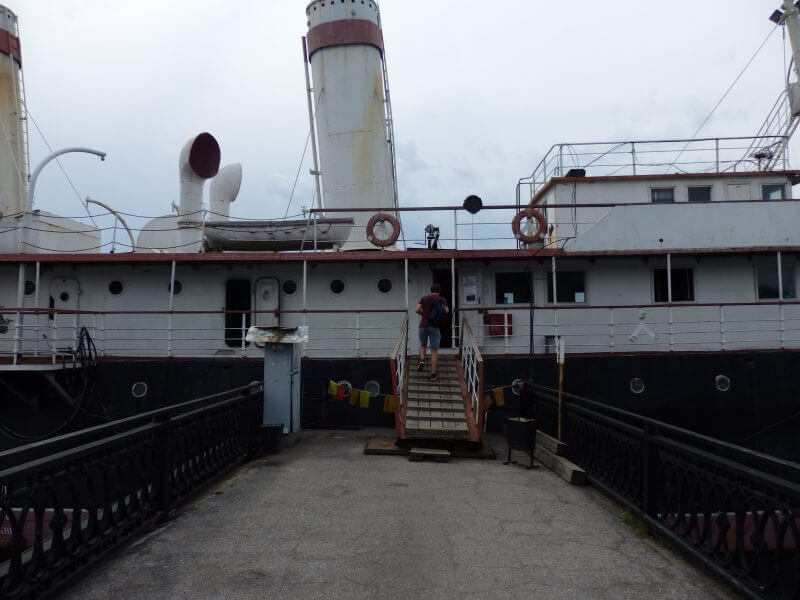 One of the oldest steam ice-breakers in the world, built in 1900. After tonnes of ‘ice-breakers’ that nearly drove me crazy in school, finally a REAL ice-breaker. 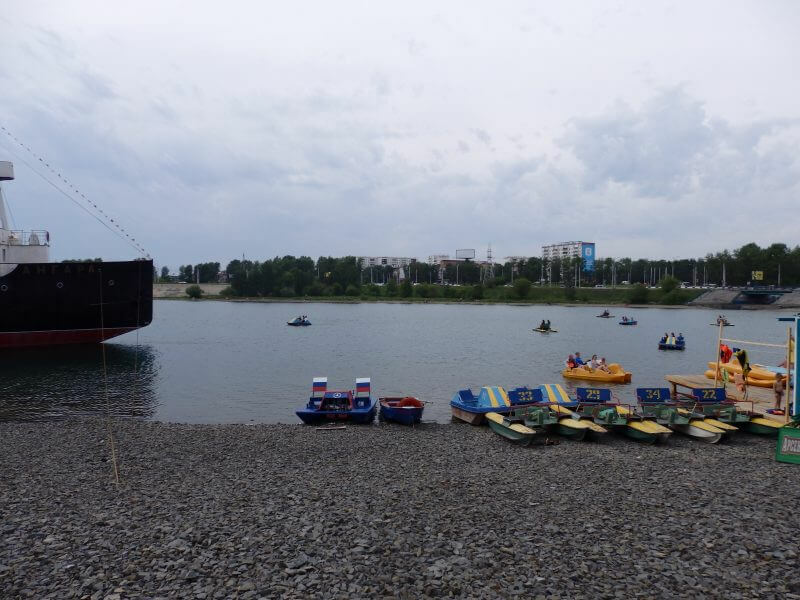 There was sorta a beach around the area, with people sunbathing and rowing around in the middle of summer. Definitely still not warmer than Singapore at any point of the year. There’s a some admission fees involved but it looked quite run down inside, so I gave it a pass. Looked quite run down inside. Went back to the same stolovaya for dinner as the previous day, Appetite. 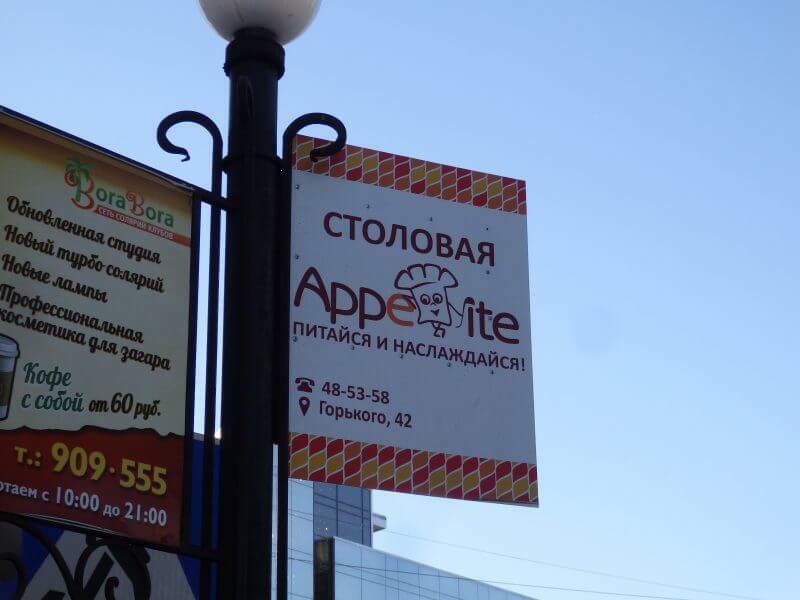 Same spot for dinner as the previous day (₽170 rubles). 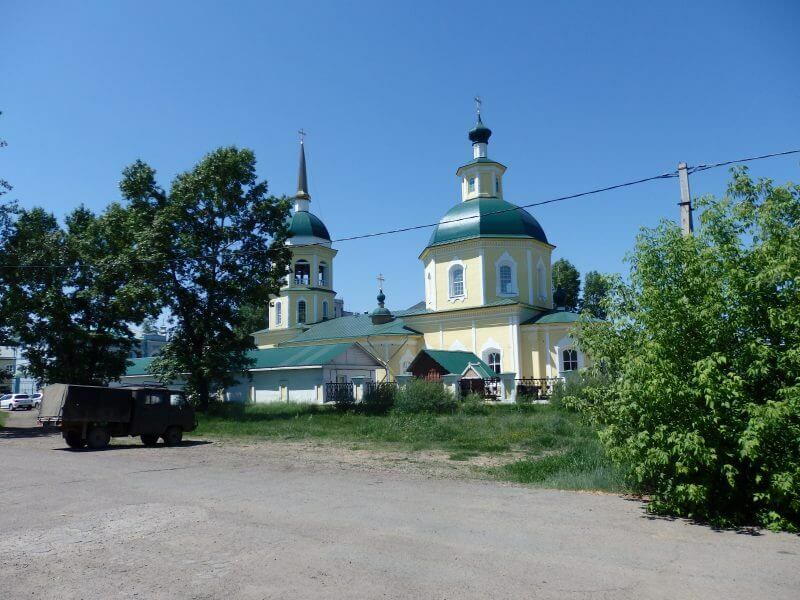 On my third day in Irkutsk, I headed out to Lake Baikal, visiting Listvyanka and making a hike to the the remote village Bolshie Koty, before returning to continue exploring Irkutsk 3 days later. It was about an hour away by minibus from Irkutsk. Back down Ul. Uritskogo. 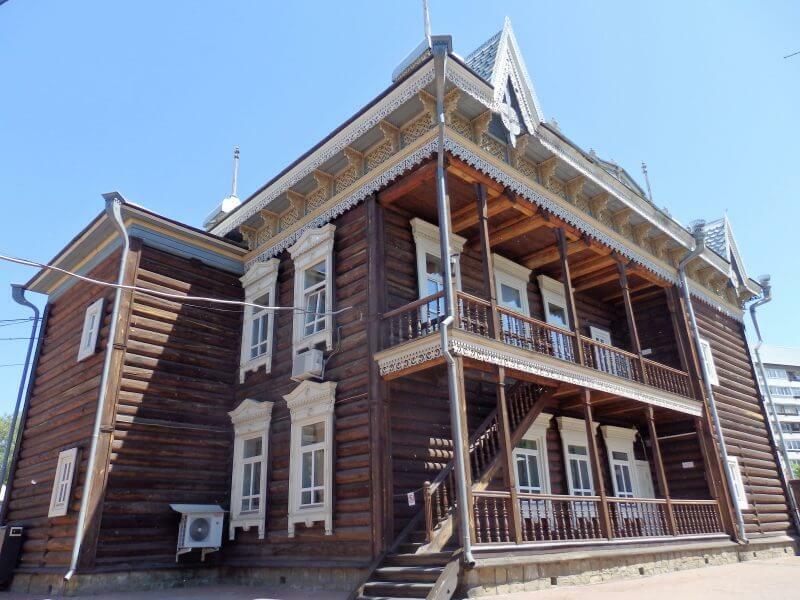 Irkutsk’s classy heritage in the early 20th century earned it its nickname, the ‘Paris of Siberia’. 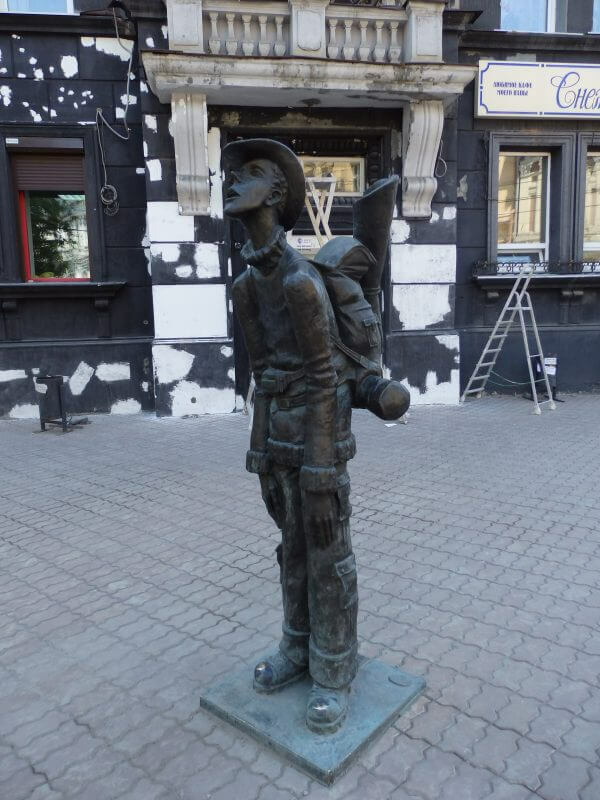 This monument is probably almost all that is similar between the two cities today. 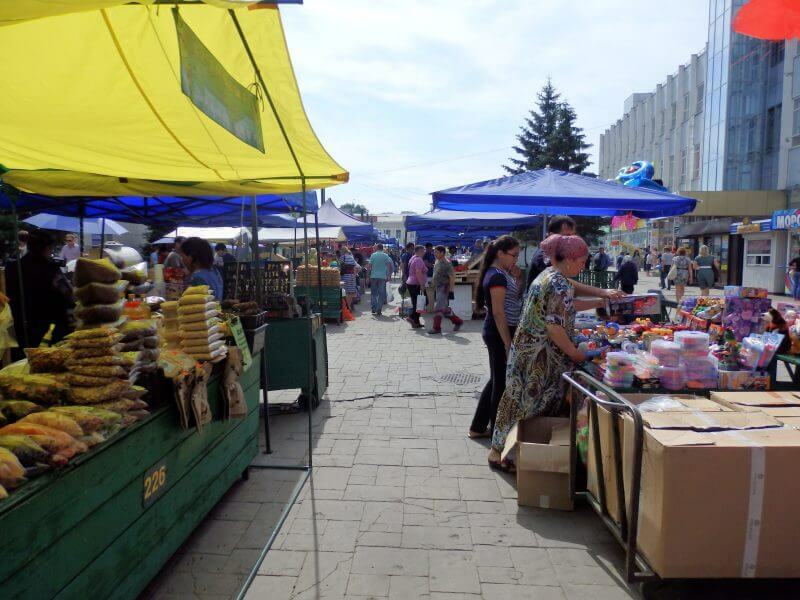 Local markets. Found the minibuses (or rather, overly enthusiastic bus attendants found me) after I made my way through the maze of tents and soon I was on the road to Listvyanka. Returned to Irkutsk after an amazing hike from Listvyanka to Bolshie Koty, along the mighty Lake Baikal. Probably one of the most unforgettable hikes ever. Then again, I haven’t done many. But for now, back from the semi-wilderness to the city. 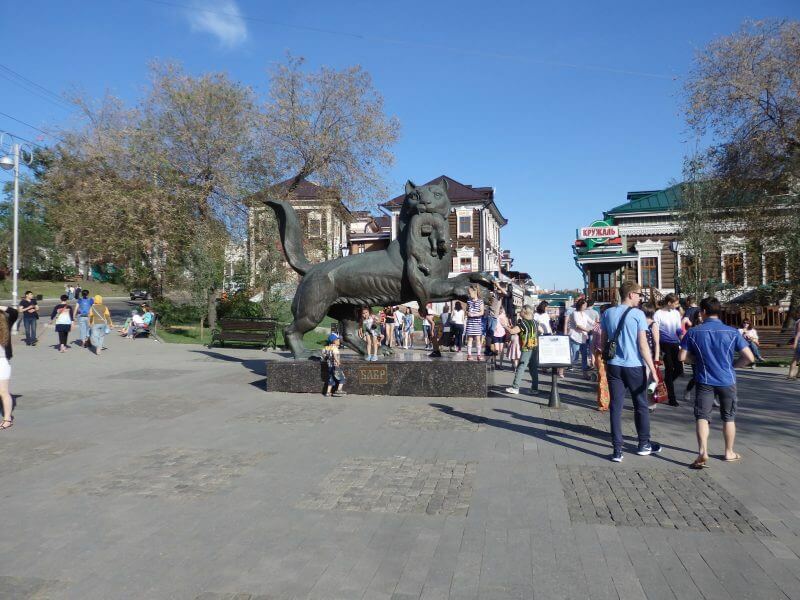 Back in the bustling (but not overcrowded) city center of Irkutsk. Dinner at a dark restaurant. 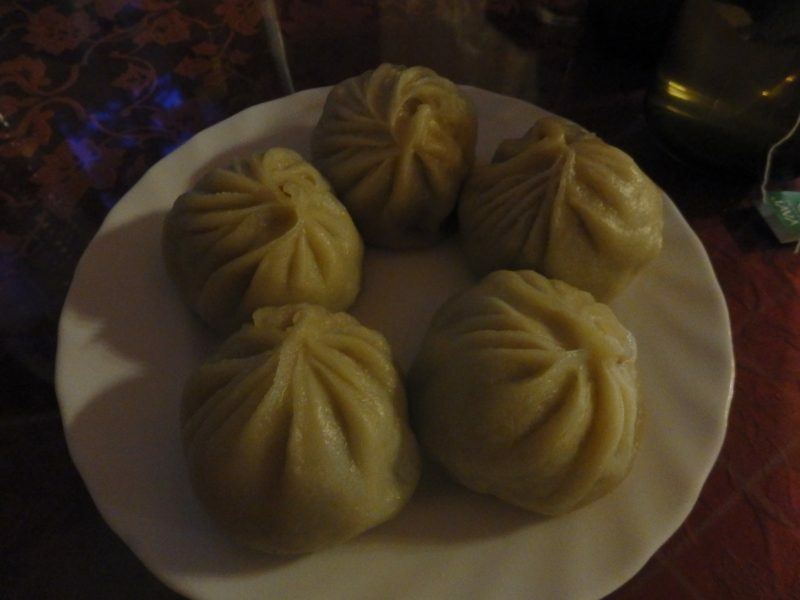 Pozy, or Buryat Dumplings (₽200 rubles). 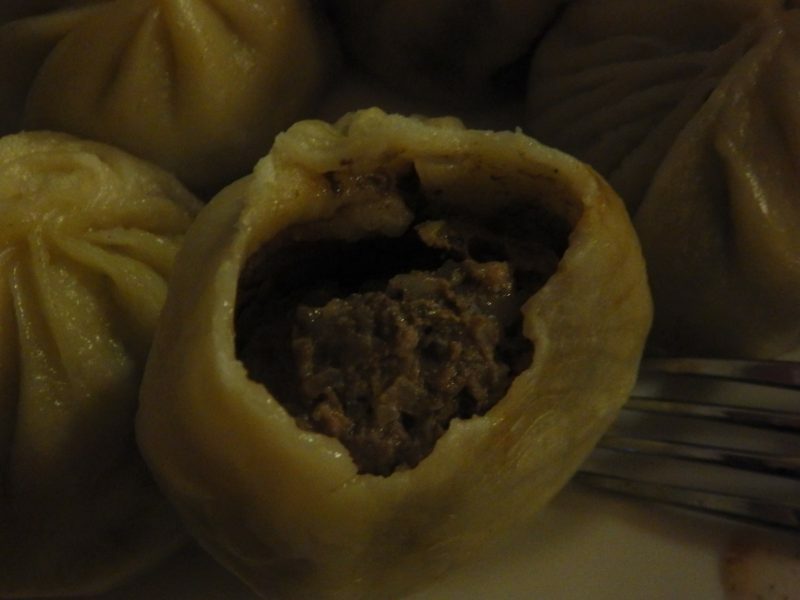 Steamed meat dumplings with some broth in it. 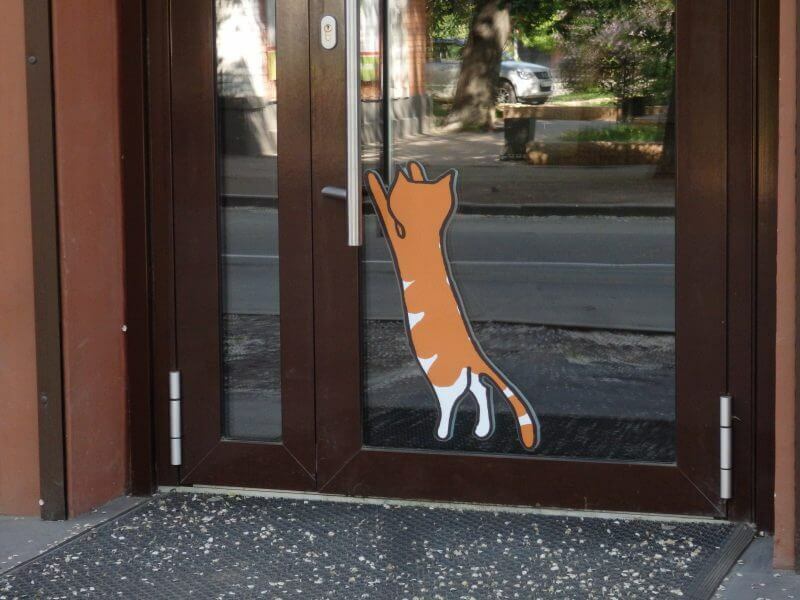 Hope it isn’t a case of great-that-you-can’t-see-what-your’re-eating. 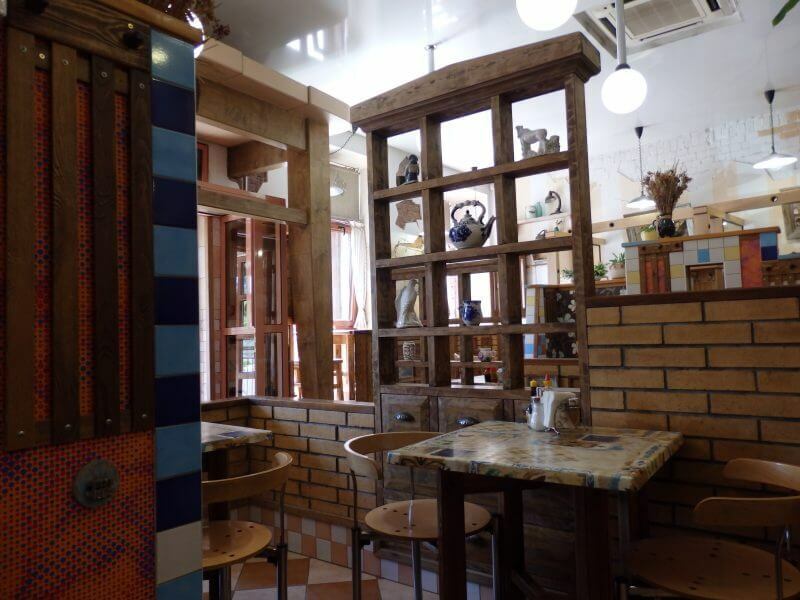 The Pozy place. Buryat people are distantly related to Mongolians, probably explaining the depiction. 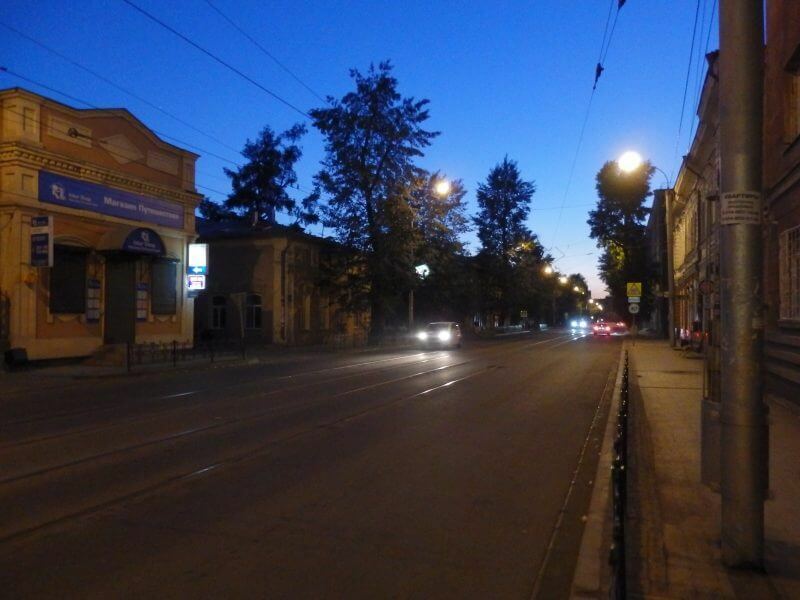 Streets of Irkutsk at night. It had been a great week in Irkutsk and Lake Baikal, but before my train was due to leave that evening, I had to do a little more exploring. 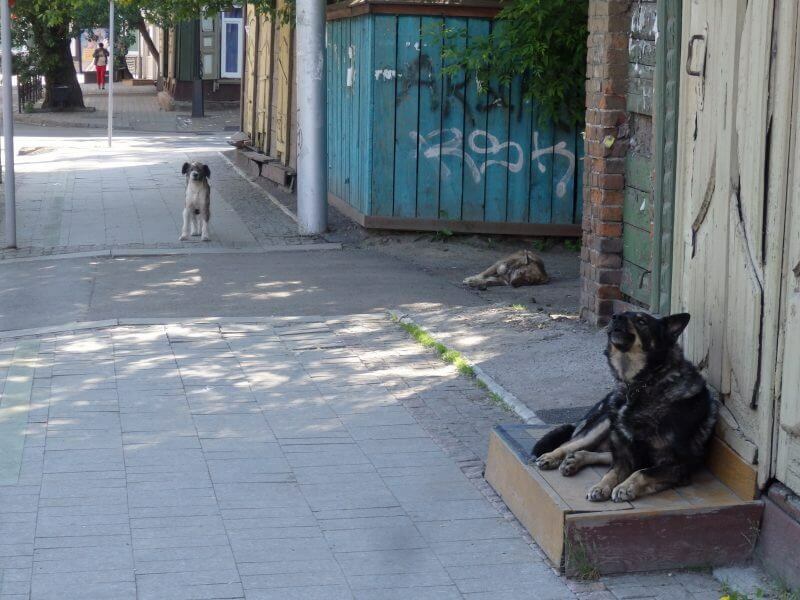 Every morning, from the back alley to the main street. 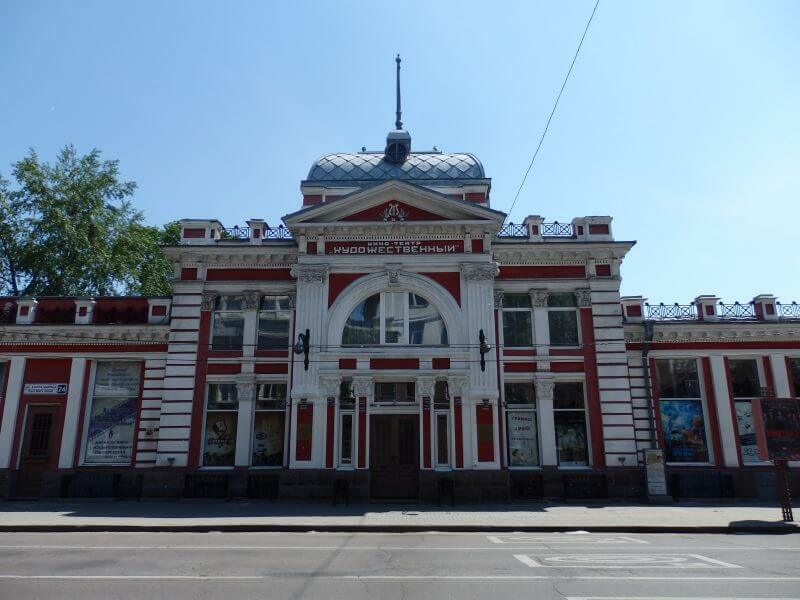 1st Public Hall (1891). 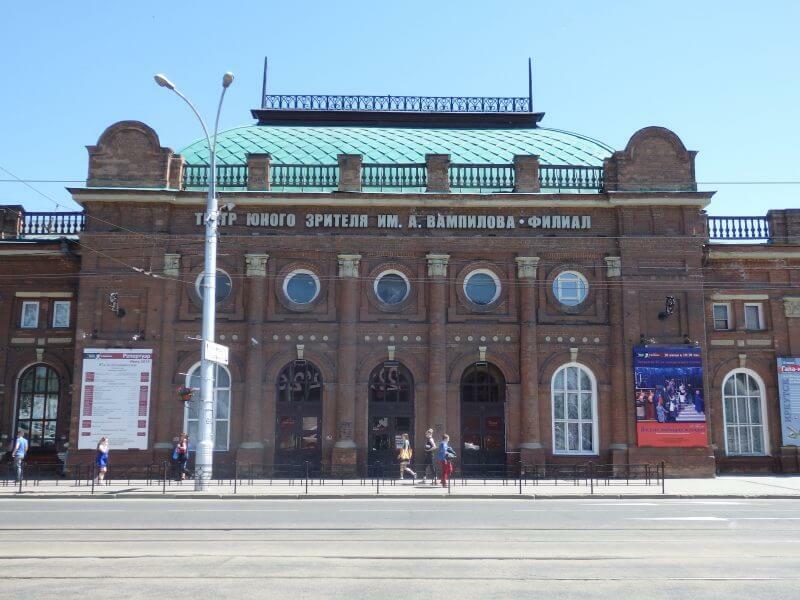 Current the Youth Theatre and Philharmonic Hall. 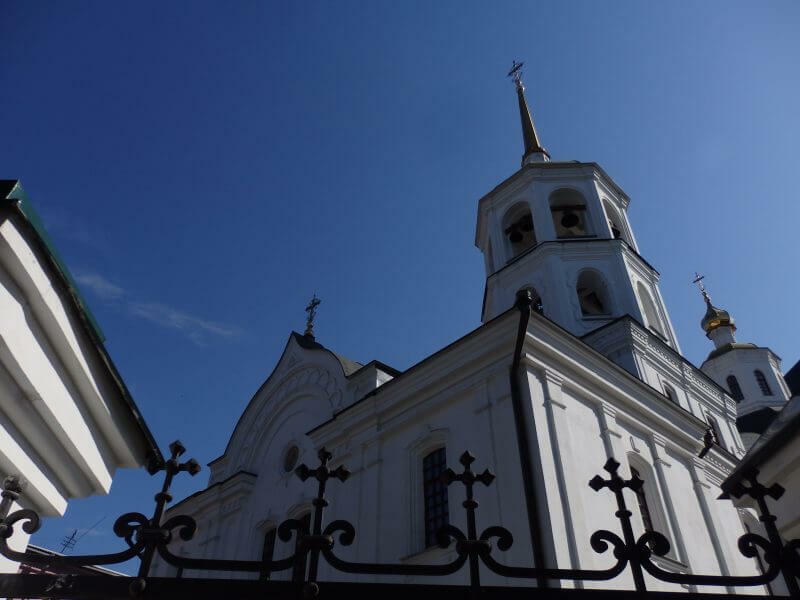 Kretovozdvizhenskaya Church (1760). You wouldn’t know even if I spelt it wrongly. 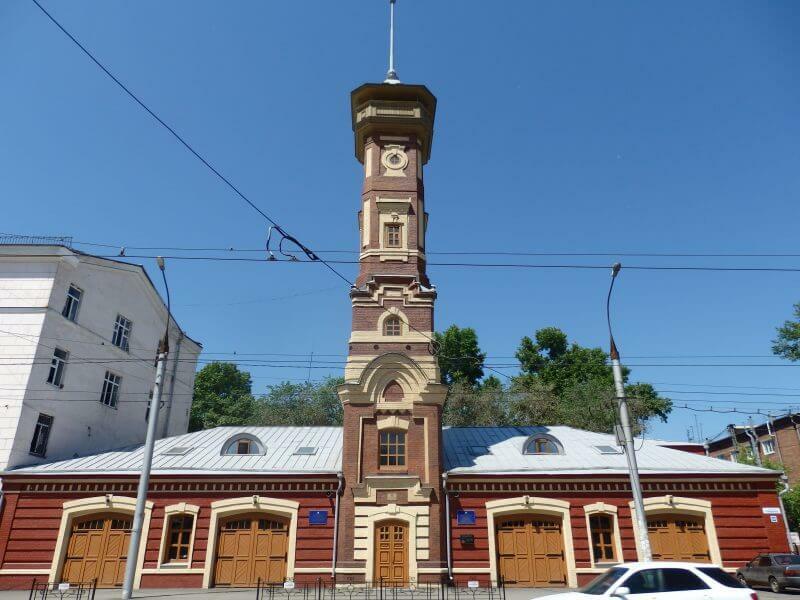 Old fire station with lookout tower. 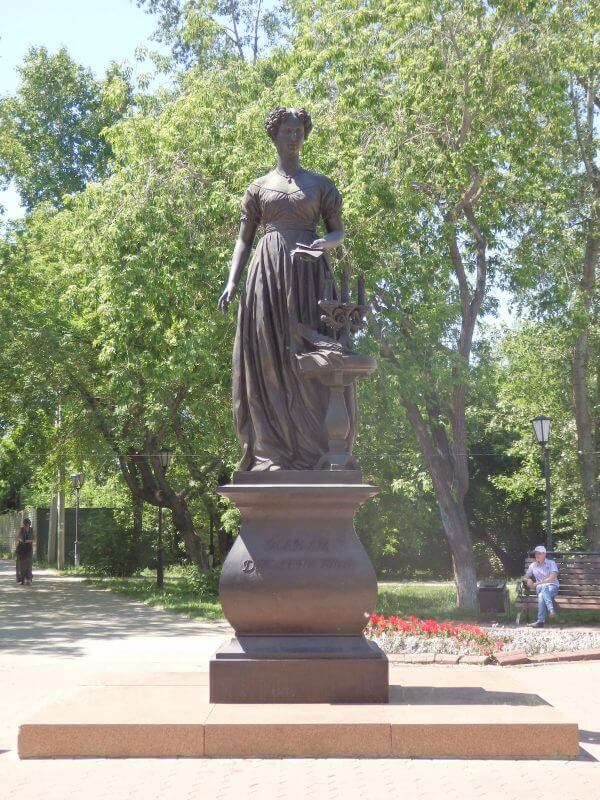 The Monument to Decembrist’ Wives. Russian women who accompanied their exiled husbands to Siberia. 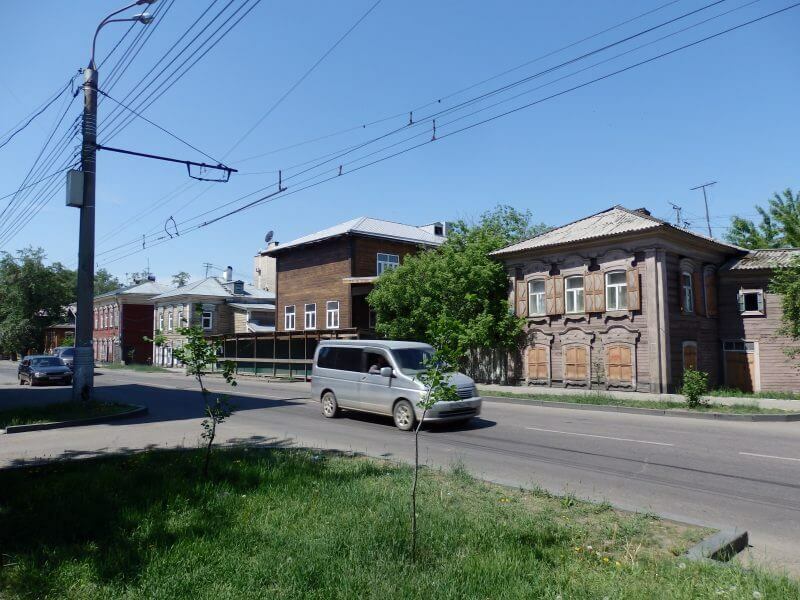 Some settled permanently in Irkutsk. 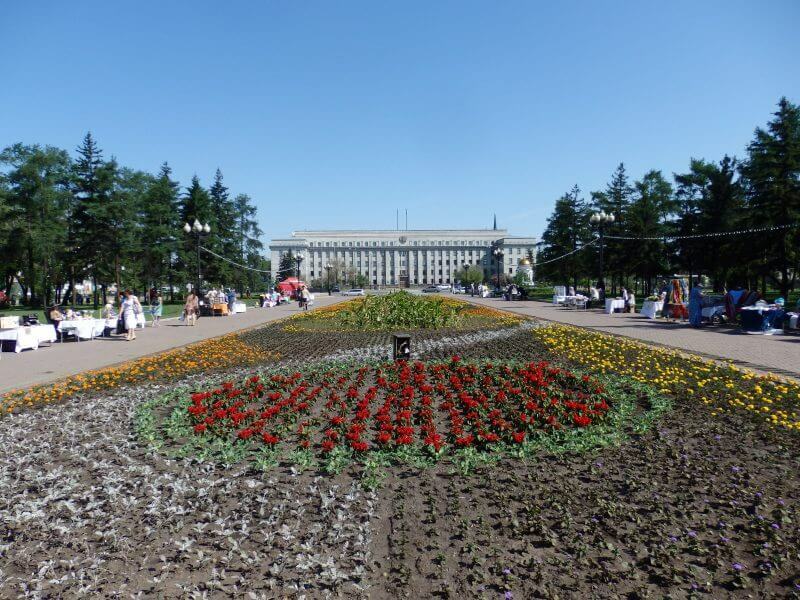 The area near the monument was where the Decembrists lived while on exile. 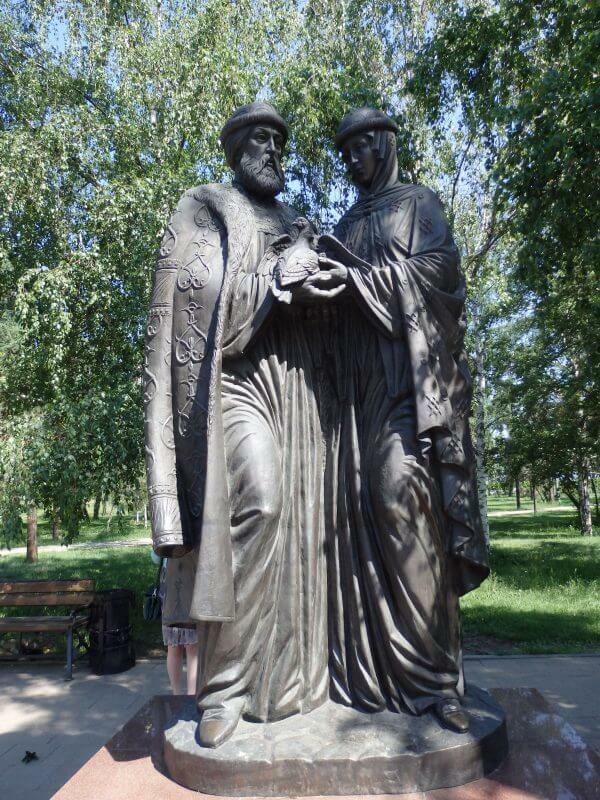 The Monument to Decembrist’ Wives. 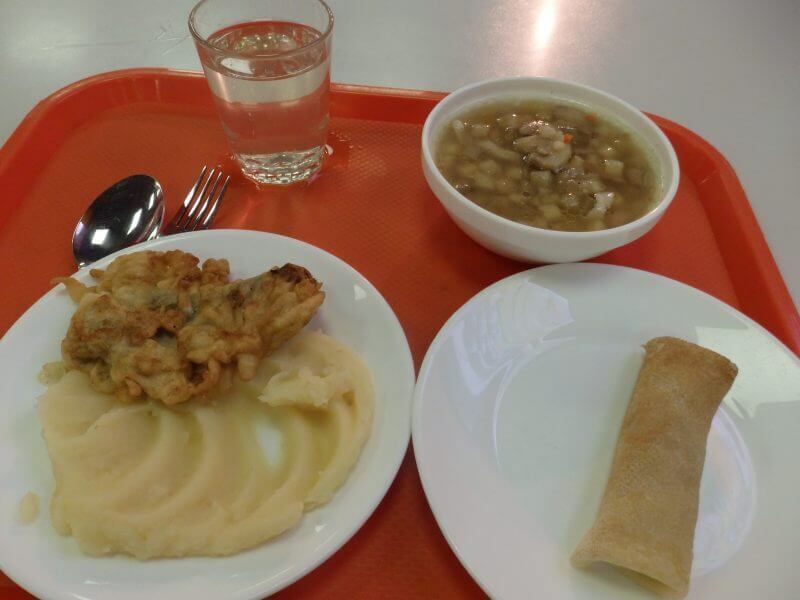 Last meal at my favourite restaurant in Irkutsk (₽175 rubles). 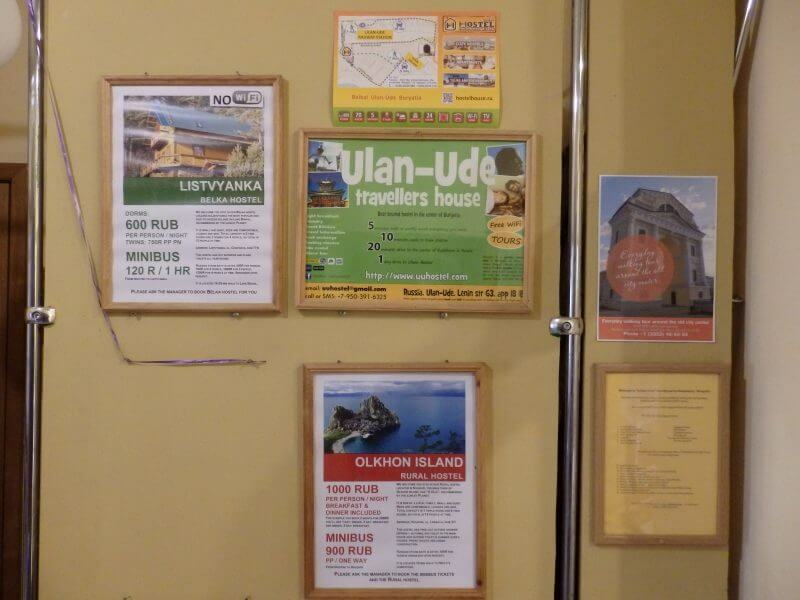 It’s possible to book accommodation/ packages for nearby destinations at the hostel I stayed in (Baikaler). 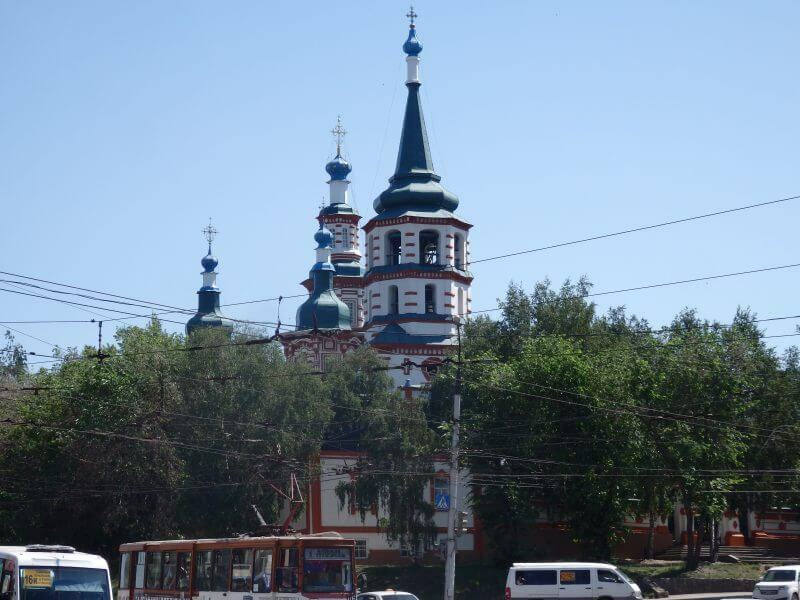 For example, side trips to Listvyanka, Olkhon Island, or Ulan Ude. 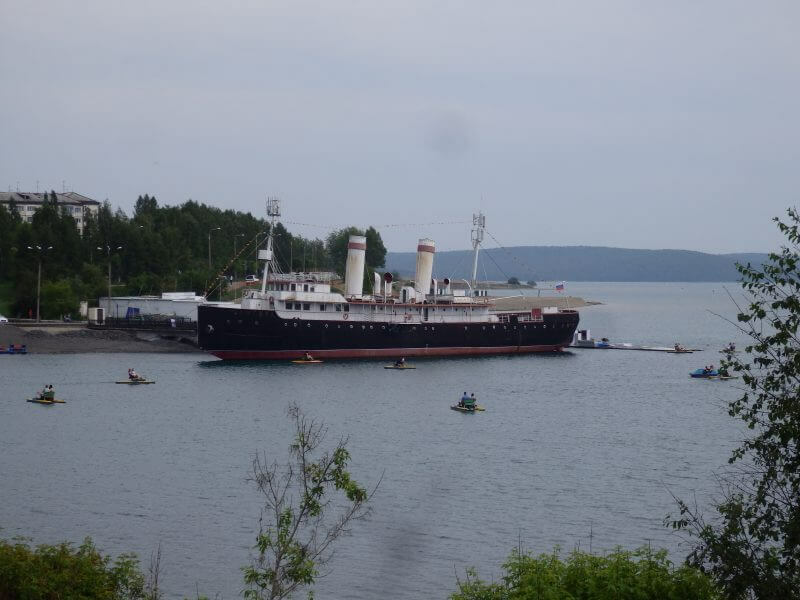 Other stuff that can be booked at the Baikaler hostel. 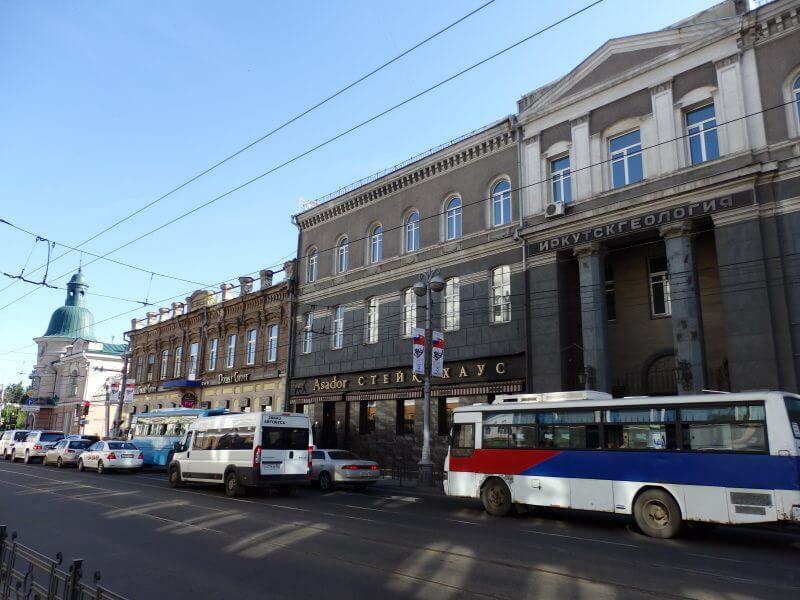 Friendly and clean hostel located conveniently in Irkutsk city. 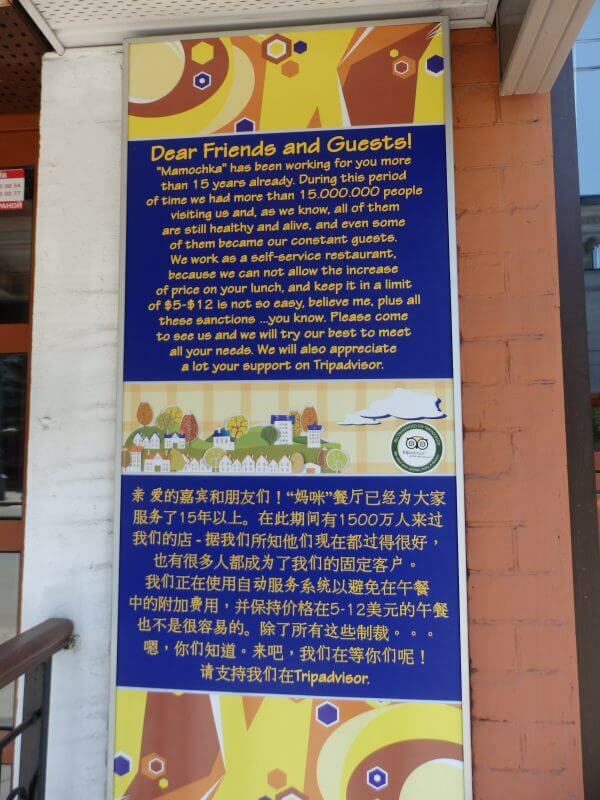 It was time to go, to continue my overland quest from Singapore to Moscow. 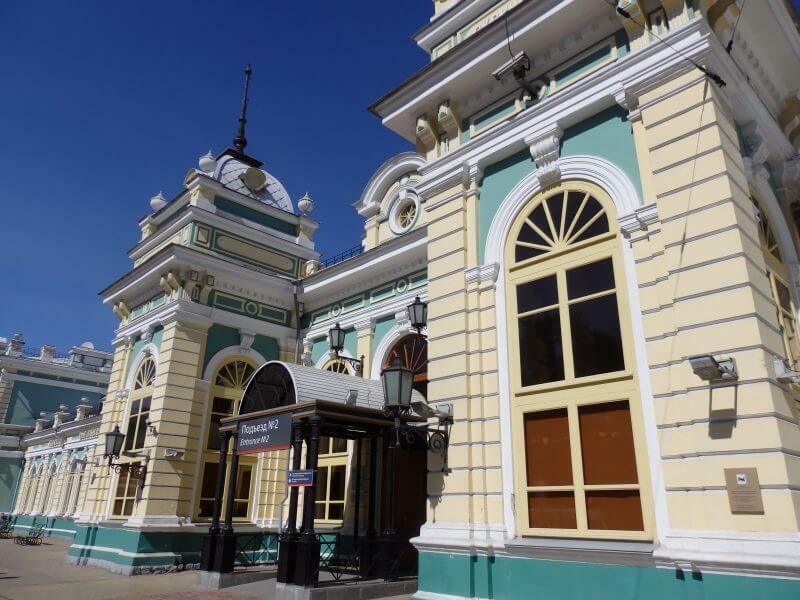 Next up, on board the Trans-Siberian Railway to Yekaterinburg, where Asia meets Europe.